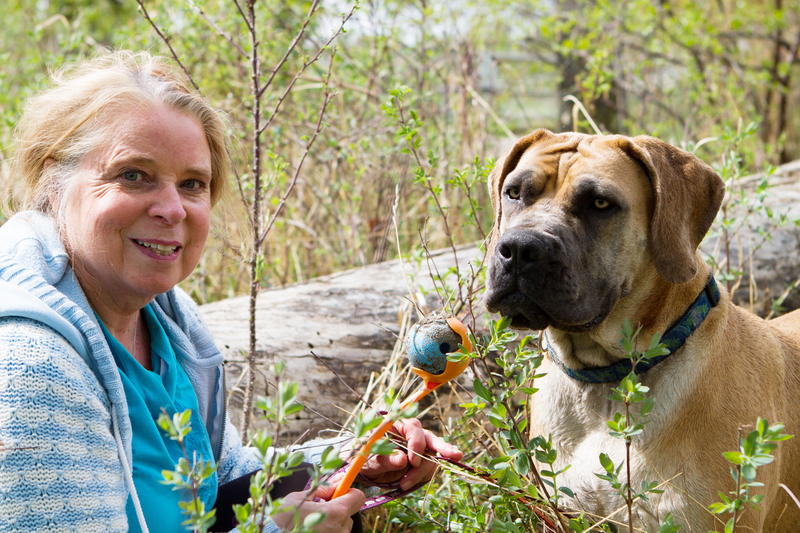 Number 45 – Once again, out for a walk at the Southland Off Leash Park, I met Zola, an impressive 2 year old South African Boerboel (pronounced “Burbul”) and her person Priscilla. I have never met a Boerboel before this, what a beautiful, majestic dog. 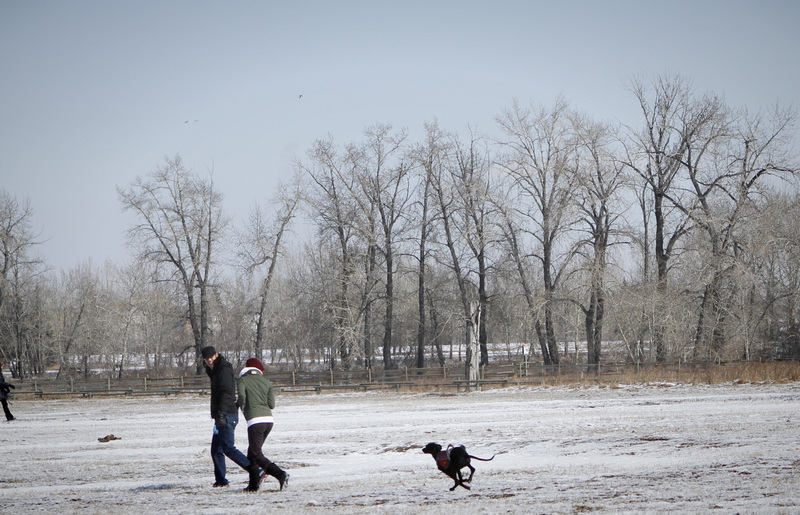 Zola loves to fetch…her ball, a stick, probably just about anything. We met up down at the river, Zola was in swimming after a stick; I have to say she wouldn’t have won any gold medals for her swimming speed like her namesake, Zola Budd, the South African Olympic Track & Field runner, but she did manage to get the stick back to Priscilla for another throw. 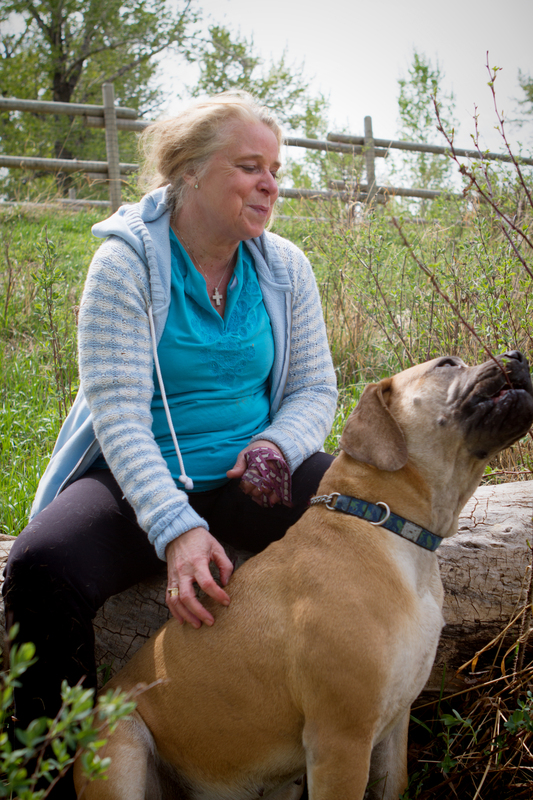 Priscilla and I had a great chat, she has always owned large, Mastiff type dogs (English, Neapolitan). When she lived in England, Priscilla showed and bred Mastiffs. Chin Scratches…Bum Scratches…I’ll Take It All! 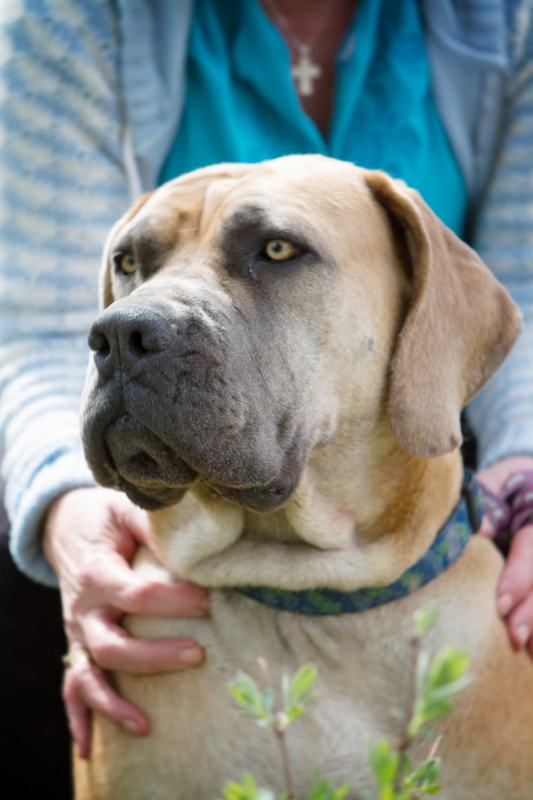 Boerboels need a real time and energy commitment from their person, they need a confident leader who can train them properly and make sure they are well socialized, Priscilla is definitely that person. Keep Scratching Right There Mom! 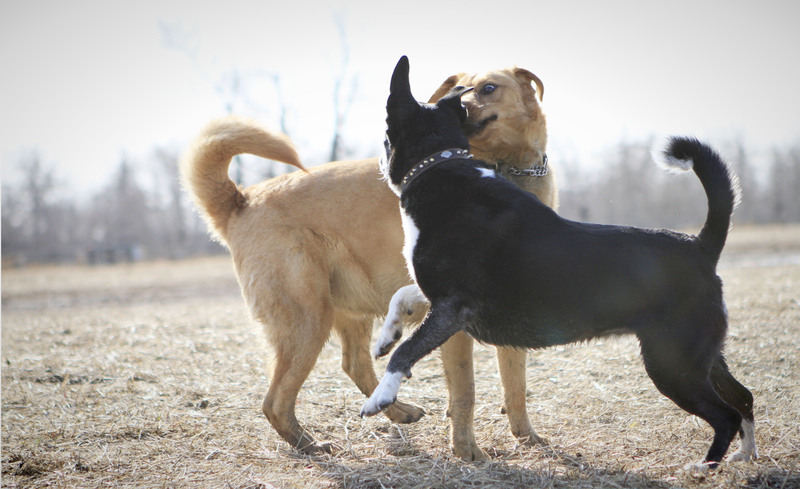 Zola currently lives with three other doggie siblings an English Mastiff, a Bull Terrier and a Bulldog. They are Helga, Teddy and Chester (I hope I got the names in the right order). You can tell Zola is a loyal, intelligent dog (that LOVES her bum rubs and chicken treats I found out). 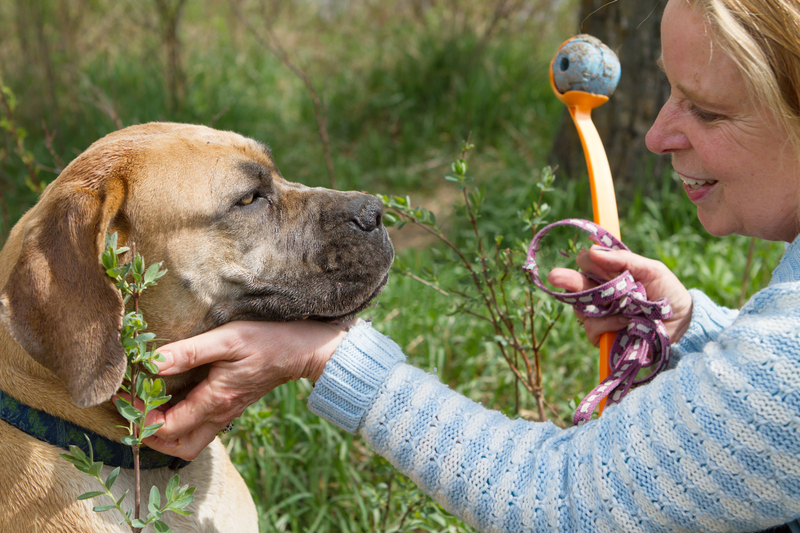 The Boerboel is a calm dog, energetic in its play, and is great with kids they know. They will protect their family at all costs. 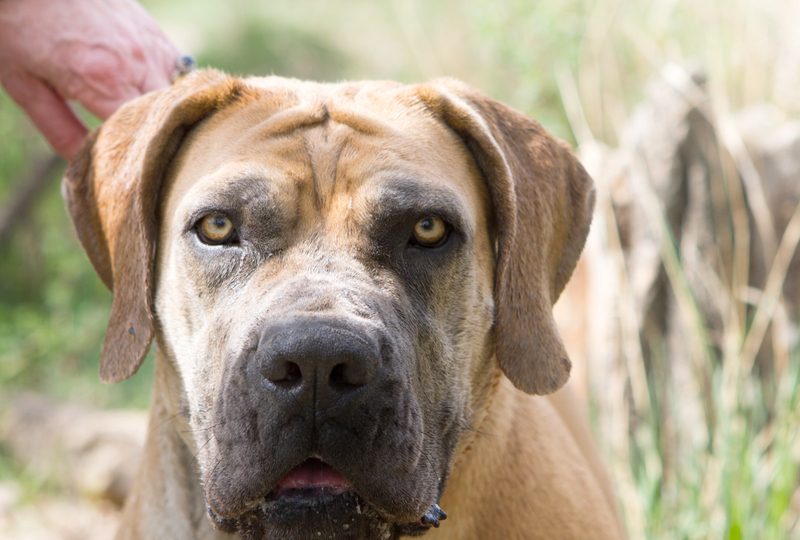 The word Boerboel derives from the word ‘boer’ which is Afrikaans for farmer, so Boerboel translates to “farmer’s dog” and is the only South African dog created to defend it’s homestead. With the love that Zola shows Priscilla I see that she would protect her no matter what. 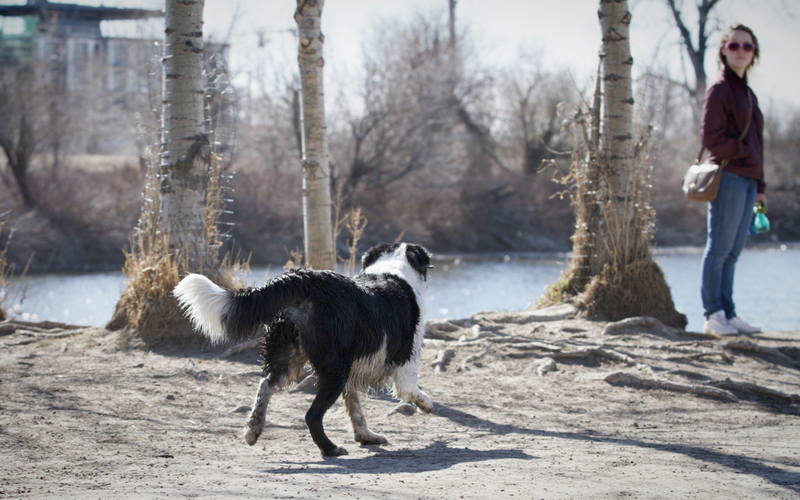 Number 43 & 44 – I met Rocky (a 9 year old mixed breed pup) at a spot on the Bow River at Southland Dog Park, he introduced himself in the river hoping I would throw something…anything…so he could fetch it. He was there with his person, Patty. We chatted for a bit and of course I asked if I could take some photos of them together; what I didn’t know was that Rocky had a sister, Juno. She was so quiet and reserved that I didn’t know they were together at first. She stood off from the group watching but came over to Patty when she was sitting on the log. At first I thought she was someone else’s dog, just coming over to say hello. 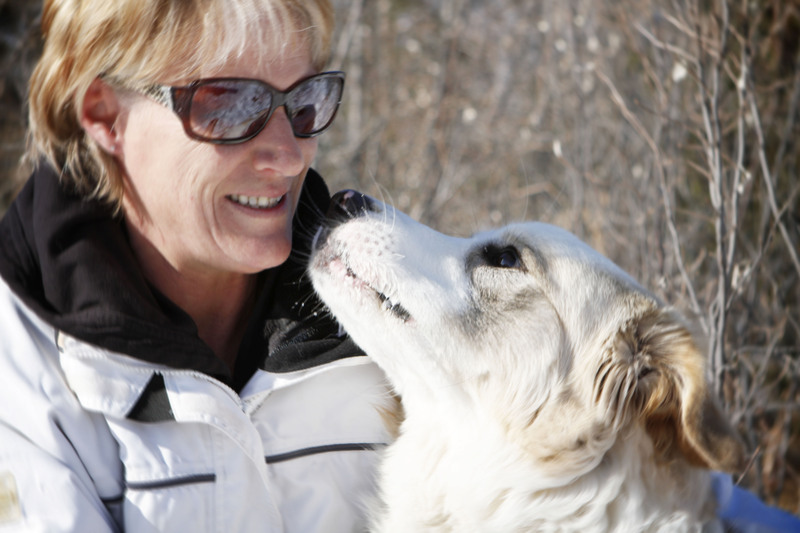 Patty is a City of Calgary Animal Services Officer and she found Juno (a 5 year old mixed breed pup) living under a truck several years ago. Juno tried to bite the other officer getting her from under the truck out of fear and things weren’t looking too good for her but with luck Patty asked to adopt her and they went home together. She is a beautiful girl, still shy, especially around larger groups of dogs. She had a bad experience at the dog park and it is still affects her. I guess she figured our big mob was okay and was quite comfortable by the time we parted company. You can see from the little pink spot on her nose that she has Lupus. The form of Lupus Juno has is benign, it cannot be cured but it can be managed. It is not known why dogs get Lupus it can be genetic, viral or even excessive exposure to sunlight (which is a possibility with living under a truck like she did). Rocky, on the other hand, walks into the dog park, surveys his domain to see who has a ball and runs off to see if he can join in the fun!. Rocky looking for some action! 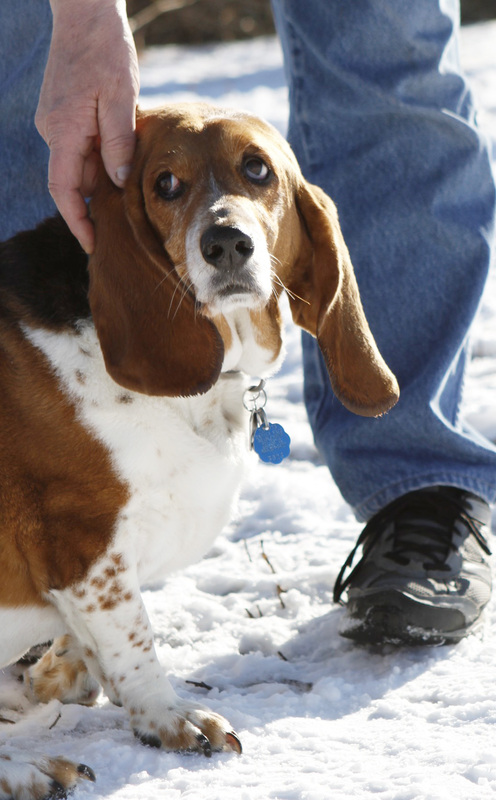 Rocky came into Patty’s life at around 2 years of age when he was found abandoned in an apartment. His leg was broken and although it healed crooked it certainly has not stopped him in his pursuit of happiness or slowed him down in any way. These two pups are so well loved and make a wonderful family together. Number 41 & 42 – Meet Jack and Lindy, two Oriental Shorthair cats and their person, Leslie. They came all the way from Abbotsford, British Columbia with Leslie’s husband, David. Jack is a 9 month old Blue Lynx Point and Lindy a two year old Brown Ticked Tabby. Only Jack came out to be introduced and say hello; Lindy was quite comfy lounging and snoozing in her carrier so we didn’t disturb her. 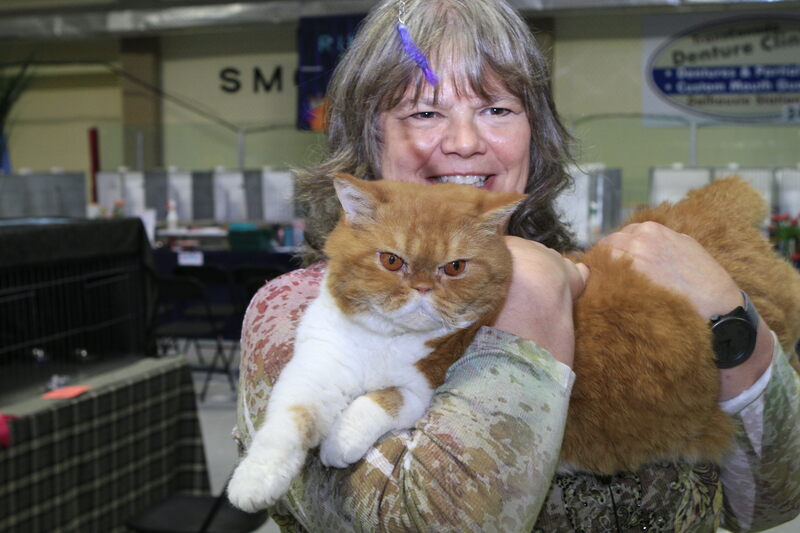 Leslie and David are not breeders, they enjoy travelling around to the shows and enjoy the competitions for all of the friendships they have made with fellow competitors and cat lovers. They have travelled throughout BC, Alberta, Washington state and Arizona. They love these two kitties, Jack and Lindy are lively and playful at home, and bring them many laughs and a lot of joy. 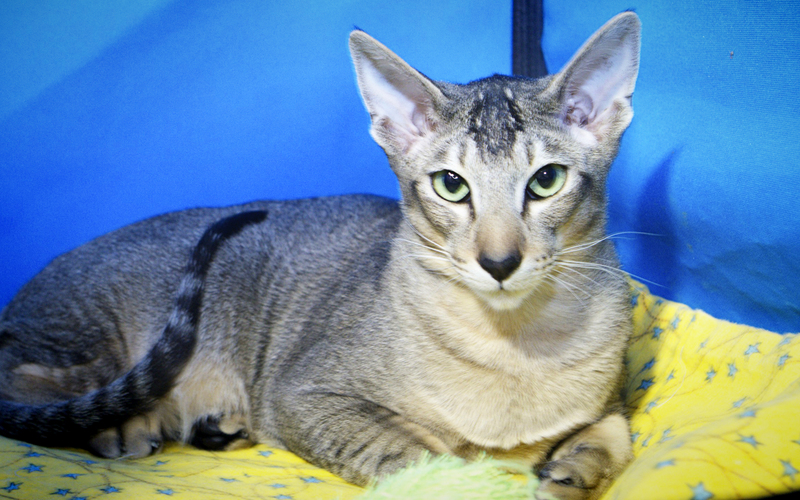 Oriental Shorthair cats are known to be very devoted to their people, they love to snuggle, and remain kitten like their entire lives. There’s a kitty under there! 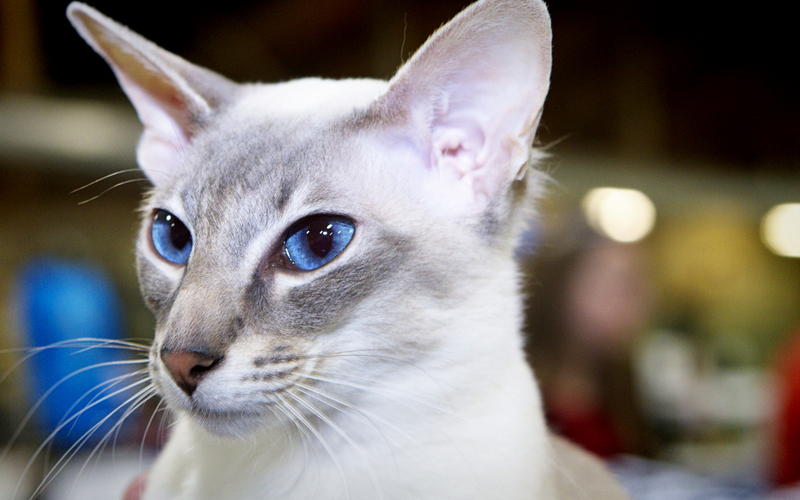 They have incredible eyes, I just loved Jack’s blue eyes, although they are not the more typical almond shaped green eyes of the breed, they are indeed stunning. 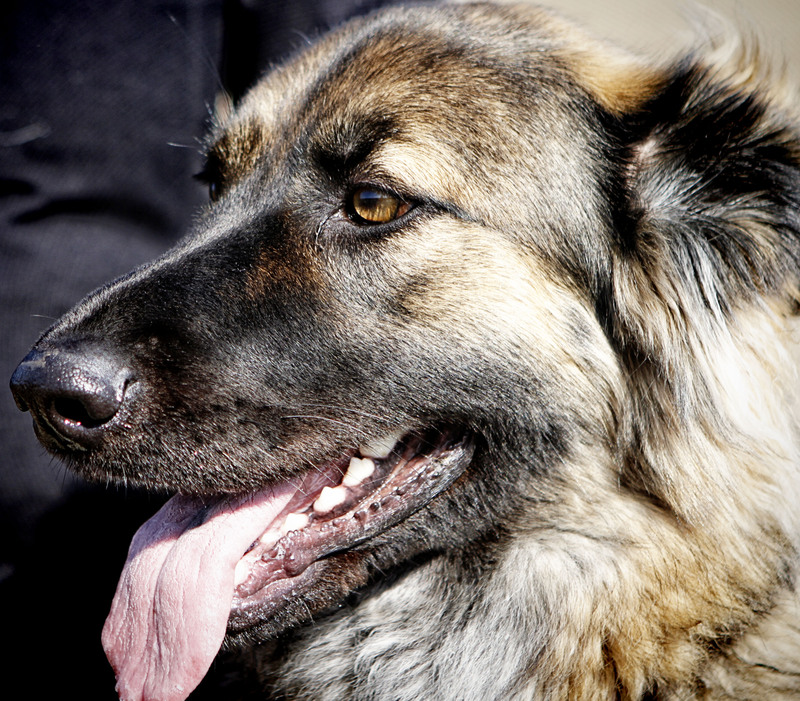 You can read more about this elegant breed on TICA’s website. Leslie and David are a lovely couple and graciously gave a lot of their time to talk with me about both the breed and their adored kitties. 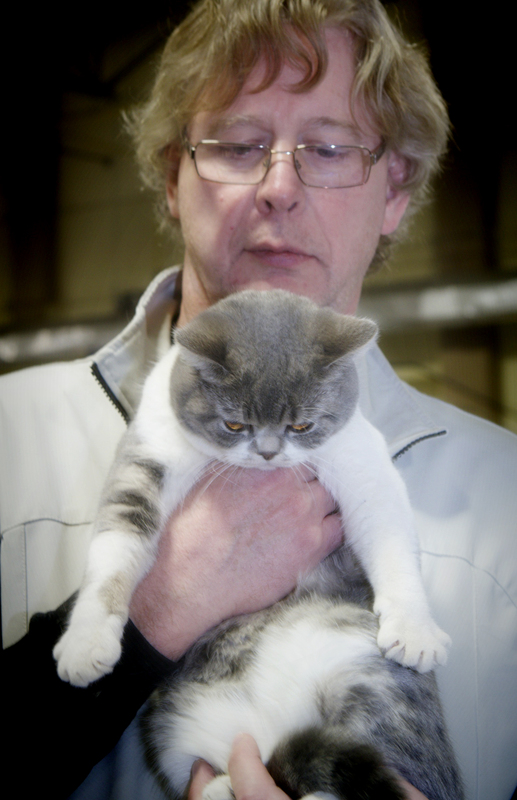 Number 39 & 40 – It’s a British invasion…of two adorable British Short Hair Kitties. Meet all 14 lbs of handsome two year old iBruiser and his person, Brenda. 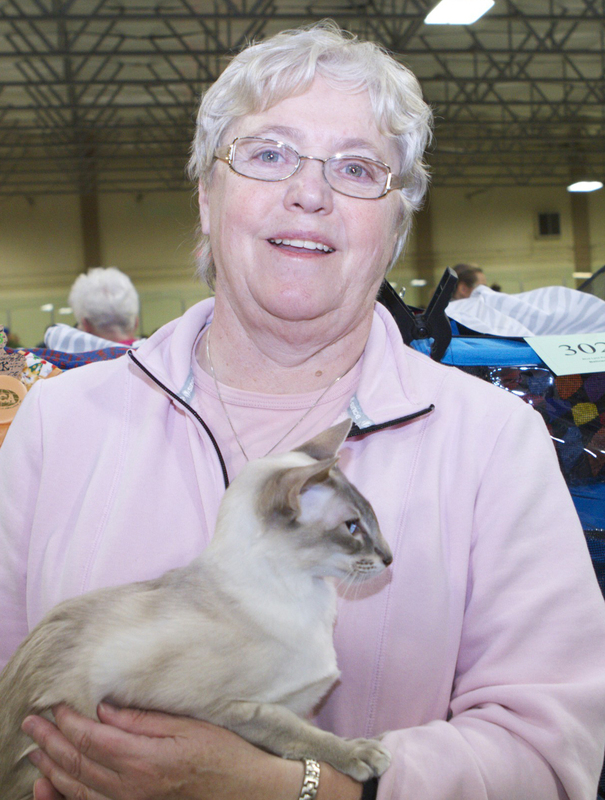 She travelled from Red Deer, Alberta with her husband, Darrell, to attend the Calgary Cat Show. 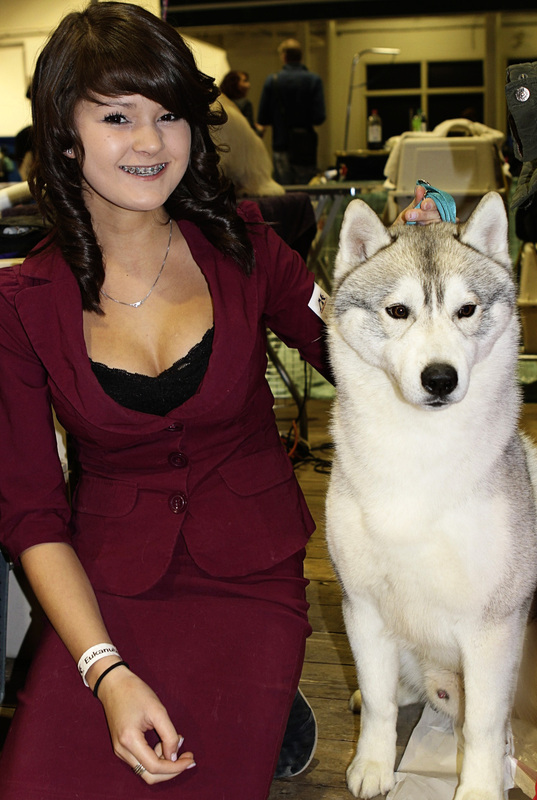 iBruiser was being shown in the altered class at the Show when I met him. What a handsome boy; I couldn’t believe just how laid back he was with all the commotion going on around him. 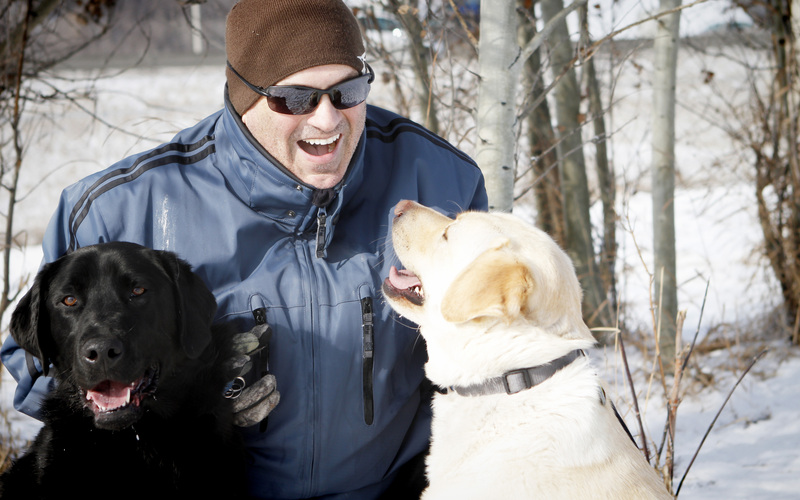 The breed is known to be friendly and affectionate, they make a great family pet and always look like they are smiling. 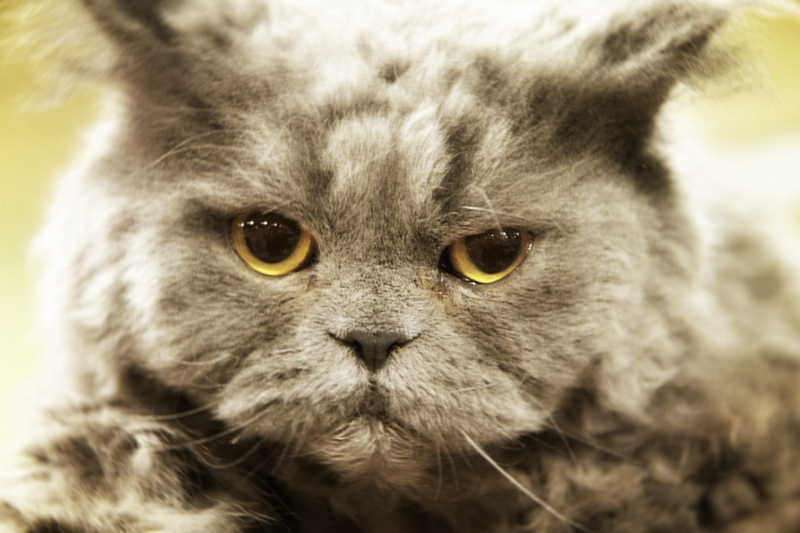 Brenda loves her cats; she is a divorce lawyer by day so they help her relax and de-stress. She shows and breeds her cats so you can check out her blog, www.magnacatta.blogspot.ca for some adorable photos of her cats and kittens they have had and litters they will be having in the future. There is a fantastic photo of iBruiser as a kitten; it is hard to believe he could ever have been that little. The other kitty that came out to say hello was eight month old Blue Star, he is a blue spotted tabby with white, and oh so sweet. Braveheart was also at the show with them but didn’t come out to say hello. He was a stunning blue cat, bigger than iBruiser. Brenda co-owns him with a woman in Hamilton, Ontario so he is well travelled as he splits his time between his homes 50/50 and is originally from Australia. They are all beautiful cats, part of a big happy family, and very much loved. 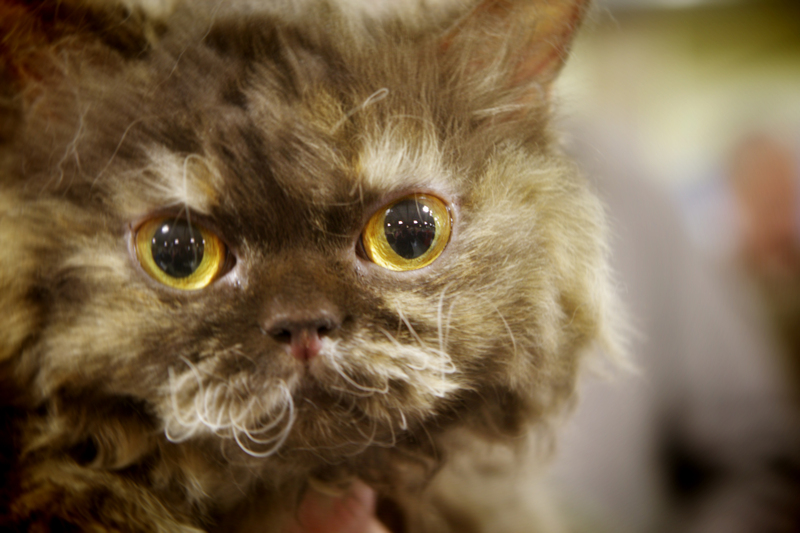 Number 37 & 38 – Meet Hawn (as in Goldie) a Munchkin Kitty; no that’s not a term of endearment but an actual cat breed, Rudy (that’s ‘Sir” to you and me) and Hannah (as in Montana) both Selkirk Rex kitties. 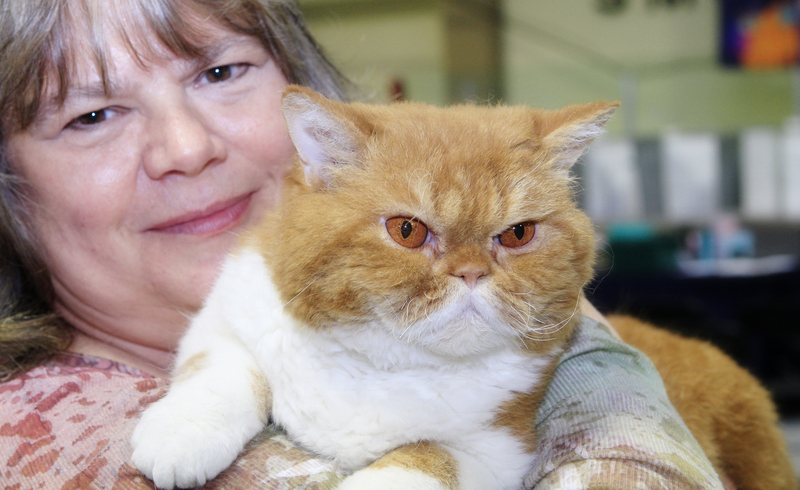 These three cuties were all at the Calgary Cat Show with their person, Cyndi and her friend, Nadine. 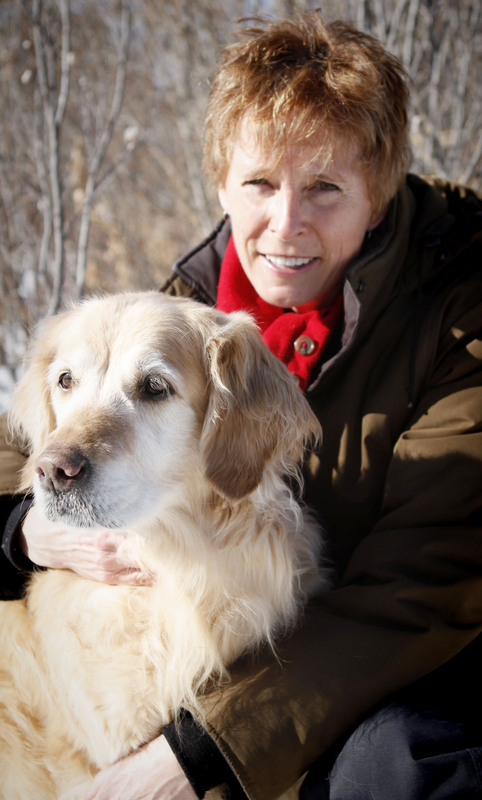 Cyndi is the owner of Foothills Pet Resort, WiskerRidge Cattery and ChowRidge Kennels Reg. between High River and Nanton, Alberta. Nadine is the Kennel Manager there and I could tell she loves those kitties like her own too. 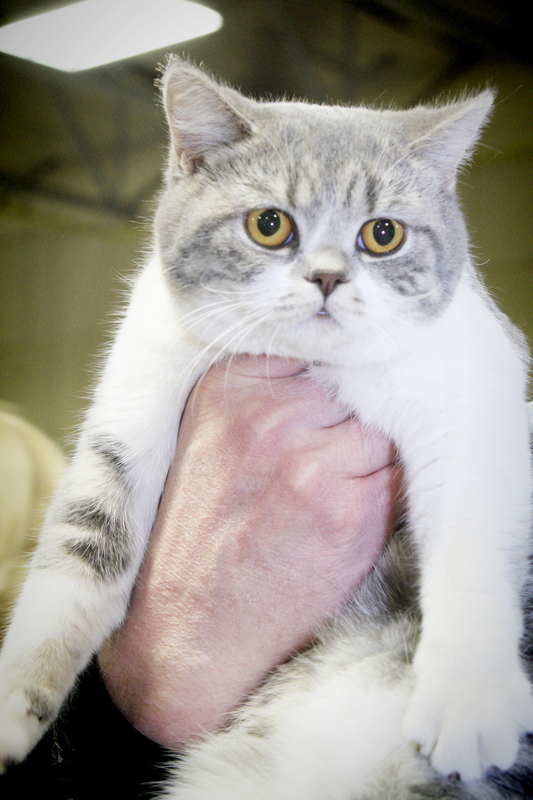 Goldie Hawn is an 8 month old Munchkin, she was the first cat I saw being judged when I walked into the Show. What a sweet, playful girl she is (she was giving Nadine love bites on her ear). Munchkins are known to be sweet natured, playful, people-oriented, outgoing and smart. 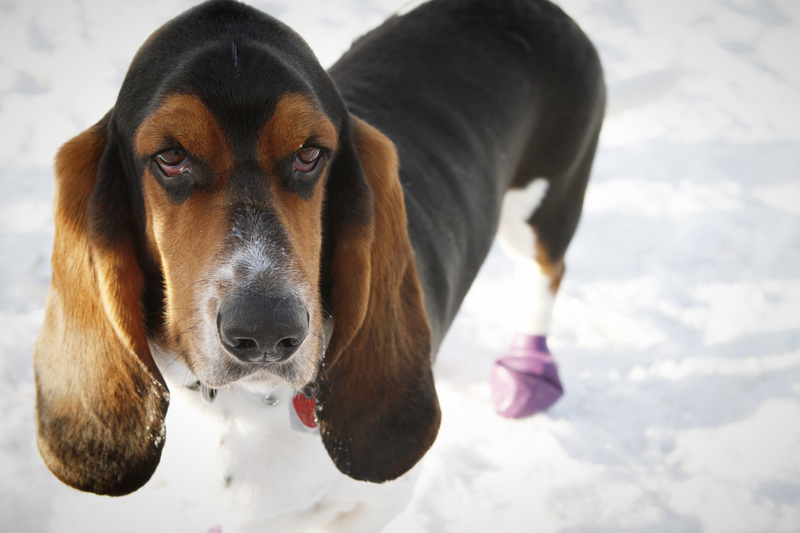 They love being handled and their short legs don’t interfere with their running and leaping abilities. Sir Rudy is a 9 month old Sellkirk Rex; we woke him up from a nap so he was a little bleary when we took his photo but he really didn’t seem to mind. Hannah Montana (aptly named as she is originally from Montana, and named by Cyndi’s daughter) is a 1 1/2 year old Chocolate Tortie Selkirk Rex, so very sweet as well. They are known as being very loving, patient and easy going cats. They kind of resemble a stuffed toy and look like they are having a Bad Hair Day too (don’t tell them I said that). You can just tell, Cyndi is an animal lover, through and through. 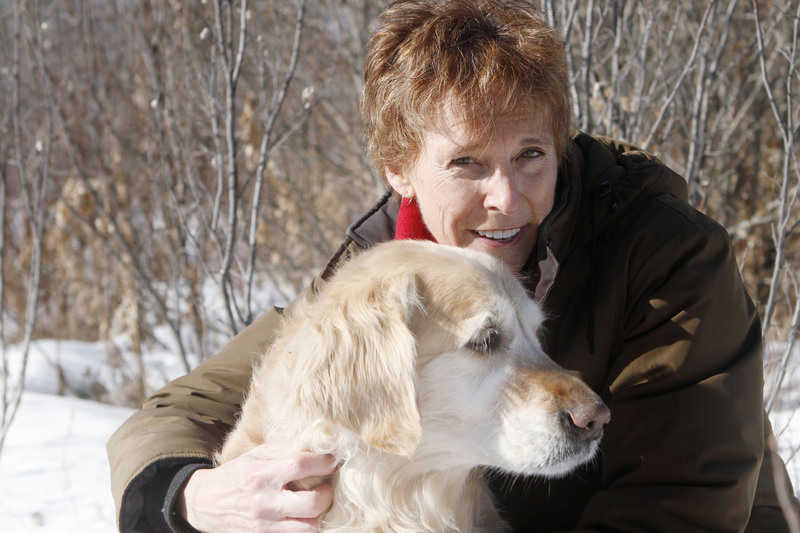 Her cats and dogs and all her clients are so very important to her. Such cute kitties these three lovelies; I am so glad I got to meet all of them. 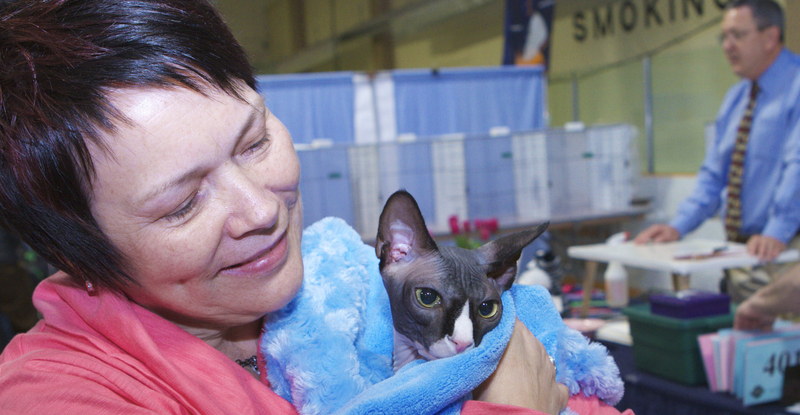 Number 36 – Say hello to Jaxx, a sweet little 9 month old Tuxedo Sphynx cat and his person, Ethel. 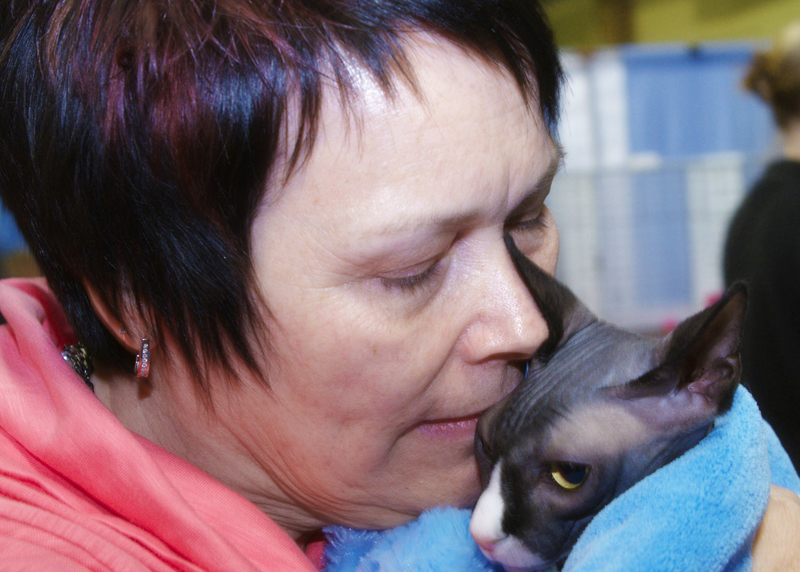 Ethel and Jaxx were at the Calgary Cat Show (his first) with Jaxx’s breeder, Dawn Magrath (of Coulee Sphynx, in Lethbridge); she was showing his sister, Lily. 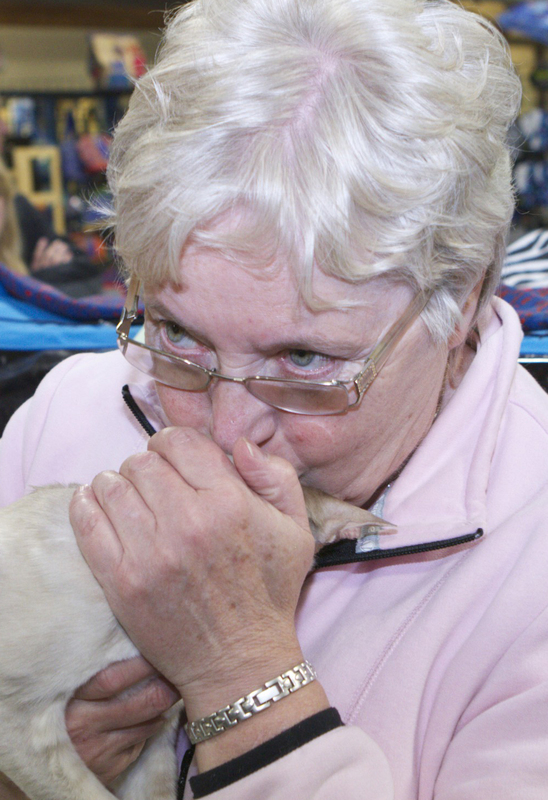 Ethel has wanted a Sphynx cat for 32 years! She finally found Dawn and bought Jaxx, her first cat, last year. Her dream finally came true! 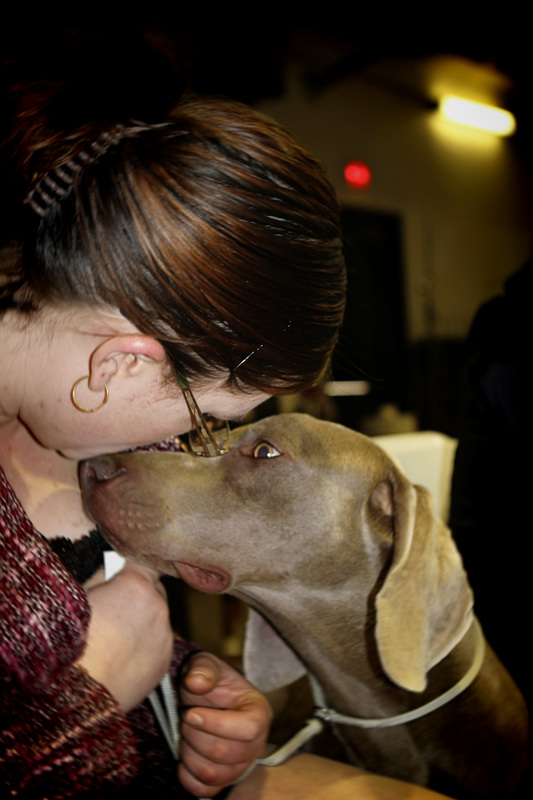 When I met them at the Show, Jaxx had just won 10th place in Best of All Breed, Altered. He is a very friendly fellow, I found him very warm to touch, his skin so soft, like a shammy cloth. 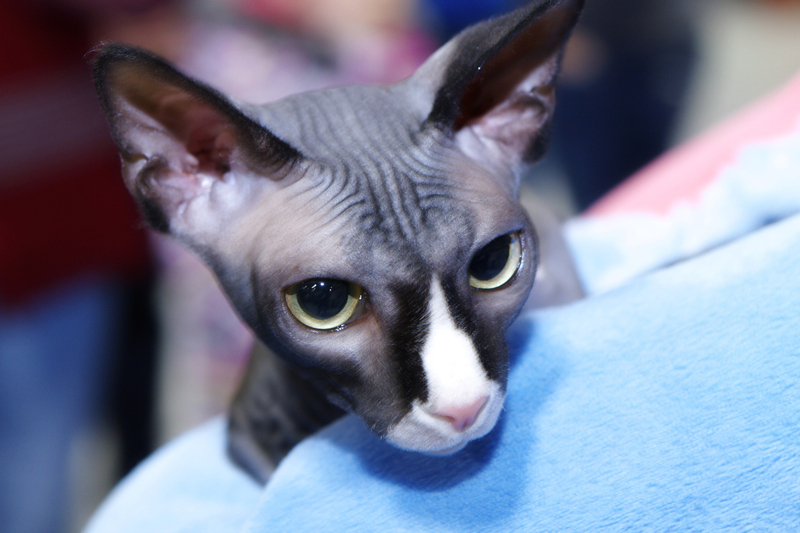 With the Sphynx breed, the body oils normally absorbed by hair can build up so they have to have a bath once a week to keep them healthy. They have limited means to conserve body heat so they should never be left outside alone or for any length of time, their skin of course is also sensitive to sun exposure. Jaxx has a little cocoon bed in his crate that he loves to curl up in to stay cozy and warm. 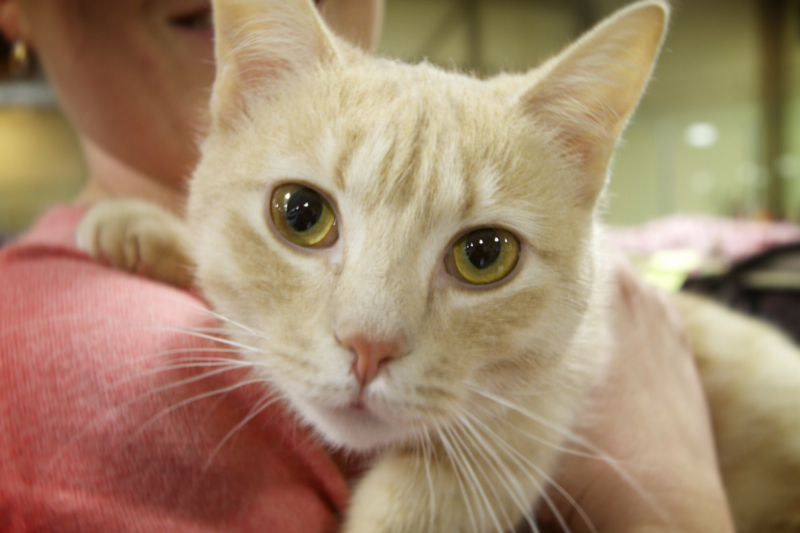 He is very energetic and playful, Ethel said he loves to shimmy along the curtain rods at his home. His four legged family includes 3 (I think) Yorkies and a Maltese pup. Of course Jaxx is their pack leader and keeps them all in line. I think you’ll find most cats rule the roust in dog/cat households. Ethel shared a very personal and touching story with me, her husband has cancer and since Jaxx has been with their family his numbers are going down (a very good thing). When they go for an appointment, the Doctor always asks what Jaxx has to say about his latest progress. 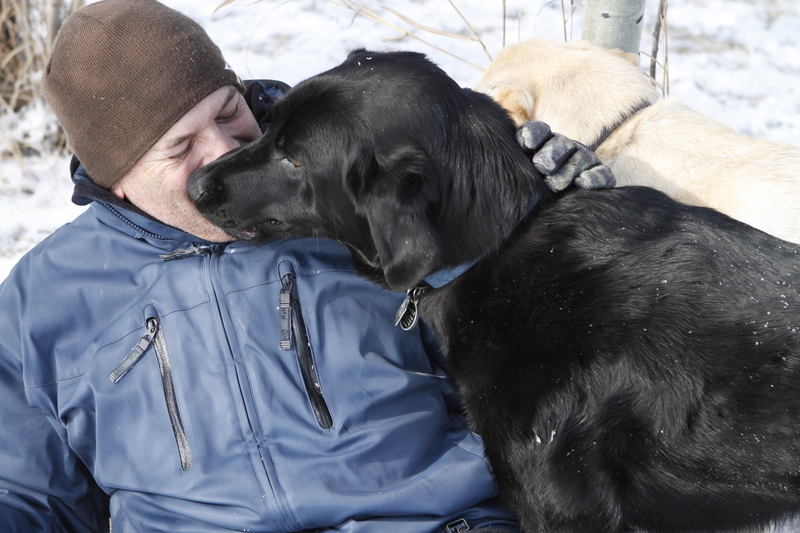 Jaxx is helping to heal Ethel’s husband as they spend time sitting together, Jaxx helps relieve his stress. Sphynx are known to be very affectionate, especially with their people, and Jaxx, most definitely is no exception, he is a special boy! Number 35 – Meet Oggie and Garry, two inseparable friends! Oggie is a 9 year old Portueguese Water Dog cross (maybe with Schnauzer…maybe Poodle…maybe cocker spaniel…but definitely with adorable!). 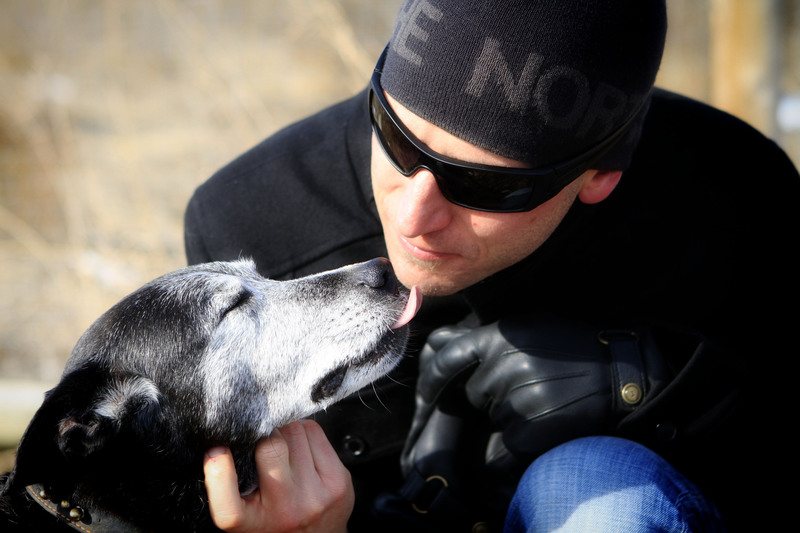 Oggie came into Garry’s life through the High River rescue group, Heaven Can Wait. 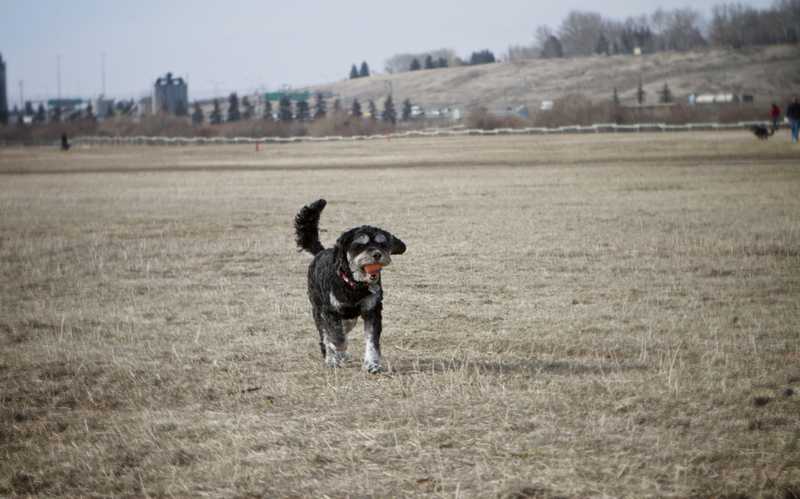 Oggie was found wandering the streets in High River at the age of one; he was so scruffy and beat up that his name while at the shelter was Raggy. 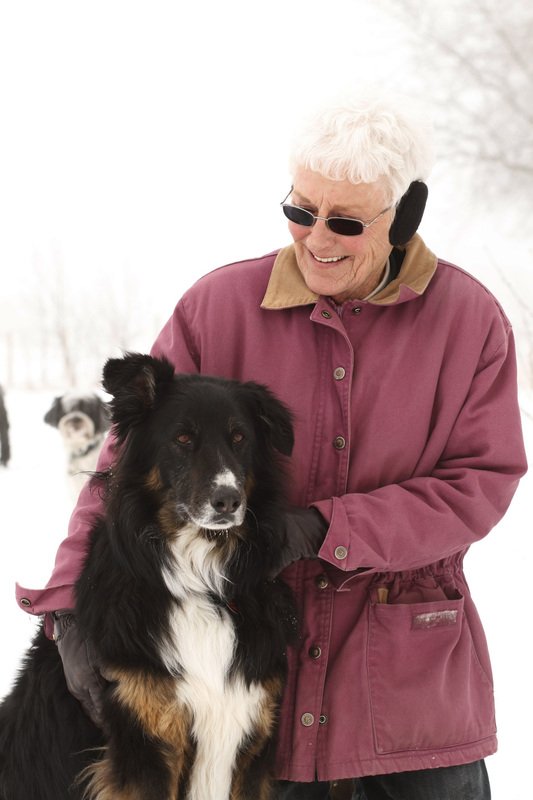 Kim Hessel, founder of Heaven Can Wait, called Garry and told him she thought she had the perfect pup for him. Garry was still grieving the loss of his special dog, Sherlock, a Welsh Terrier that Garry had from a pup. He actually bred Sherlock’s mum so Sherlock was born and raised in his house and held a very special place in his heart. Garry had Sherlock with him until the age of 14 and was heart broken when he passed. 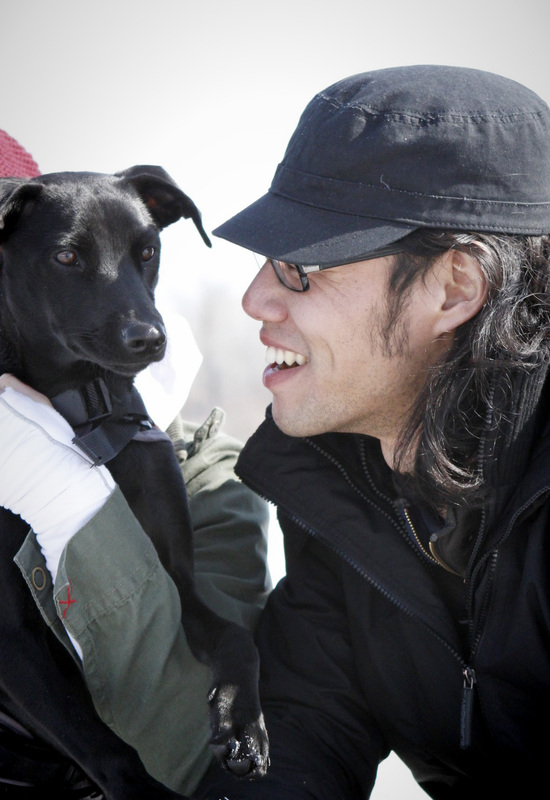 It took two years for his heart to heal and be open to the prospect of letting another four-legged friend in. Obviously, Oggie was the right pup to help Garry heal and they are great friends. When Oggie first came to live with Garry he shied away from being touched but now, as I found out, one of his favorite things (besides his orange and blue ball) is a good bum rub. The prospect of getting one is about the only thing he will stop for when he is out with Garry at the Park chasing his ball. He is one fast little fellow, the second Garry puts that ball in the chucker he’s running fast, going long, anticipating where his ball will land. I asked how he came to be named Oggie and Garry said it was from a cartoon he and his kids watched when they were little called Augie Doggie, he always thought it would be a great name for a dog, and indeed, it is. Number 34 – Meet Trinity, a beautiful, dignified, 12 1/2 year old Staffordshire Bull Terrier/Border Collie cross and her person Trevor. I knew the moment I saw her that I wanted to capture her sweet face, gentle nature and adorable ears! Look At Those Ears! So Adorable! Trinity’s lucky number must be three, as Trevor was her third home. Her original people were a young family that obviously found her high energy Staffie/Border Collie personality too much. 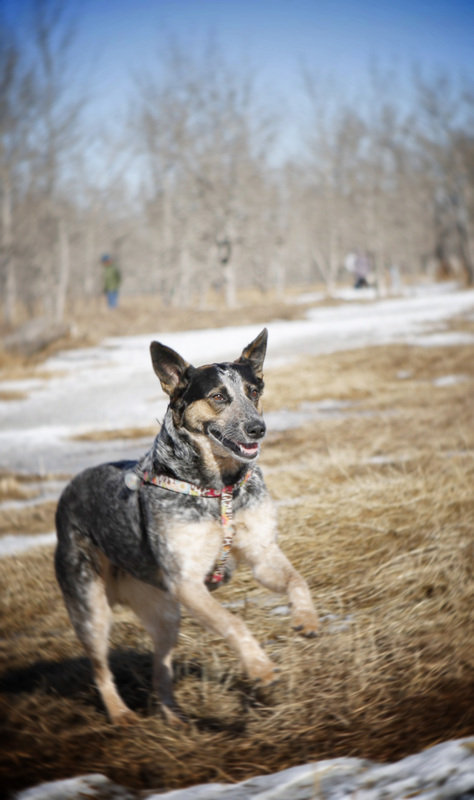 She was surrendered and off she went to live with a Biker dude, he tired of her and she was eventually found wandering in a field up near Beiseker, Alberta. 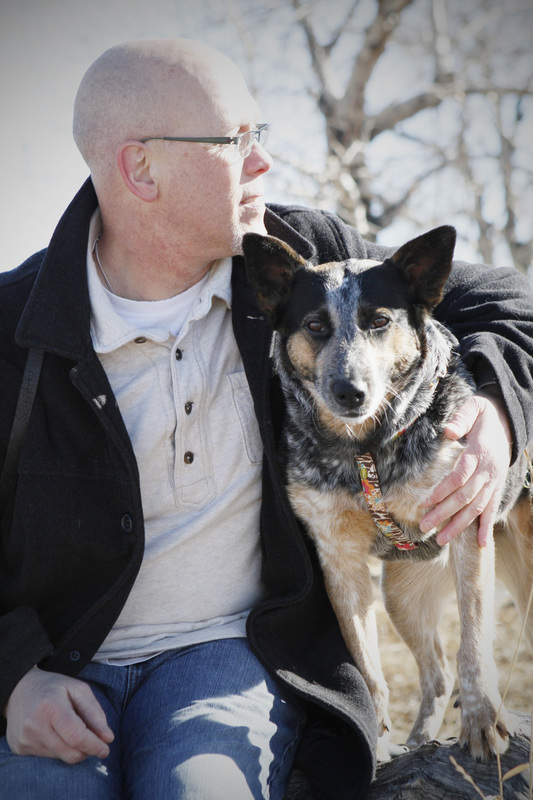 Lucky for her, she found her third and forever home with Trevor at the age of two. He said it wasn’t always an easy road with the high energy, intelligence and easily bored traits of both a Staffie and Border Collie…there were numerous incidents of chewed objects (a Staffie trait for sure). However, they persevered together and created an incredible bond that was evident upon meeting them. 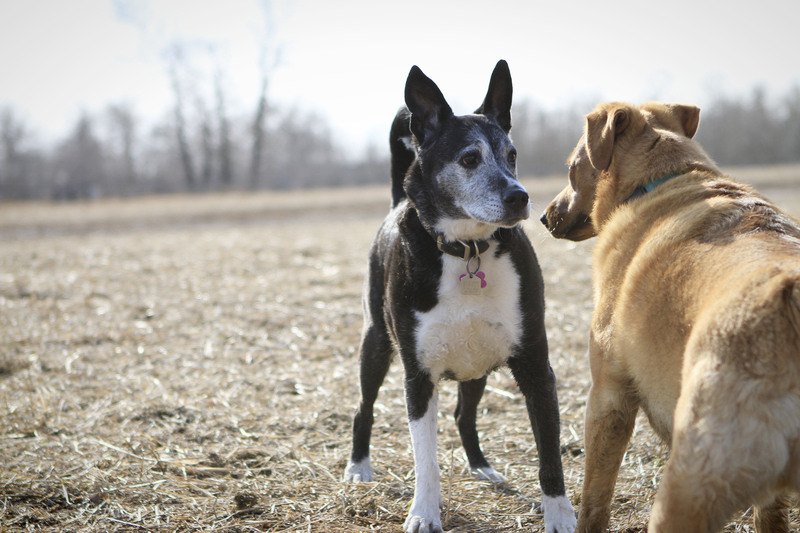 Trinity may be getting up there in years and getting a little grey around the muzzle but she still wanted to get her flirt on when she met the player of our group, Max. Trinity Getting Her Flirt on! Max whispering sweet somethings in her ear! 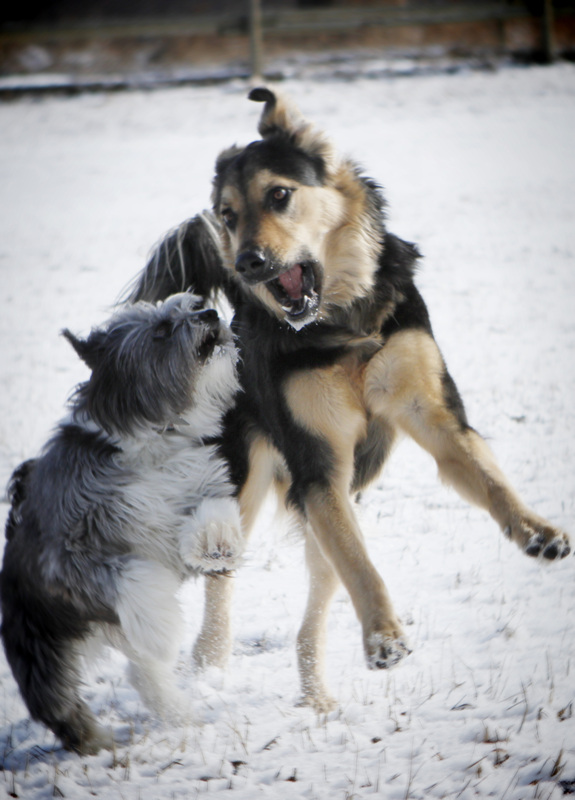 She and Max danced around and played until Trinity’s legs started to get a little shaky. She may have tired out after meeting up with our crew but she had fun and will have definitely be having some good dreams to put a smile on her face after her play. I know meeting Trinity put a smile on my face for the rest of the day! Number 33 – Meet Kayla, the dignified lady of the group. Kayla is a beautiful 11 1/2 year old Golden Retriever. 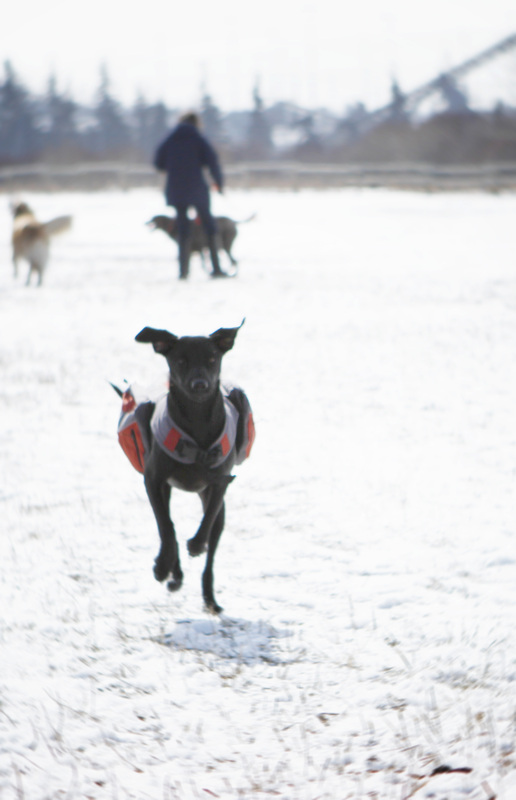 She was out enjoying the Black Diamond Off Leash area with her person Shelly and their friends. 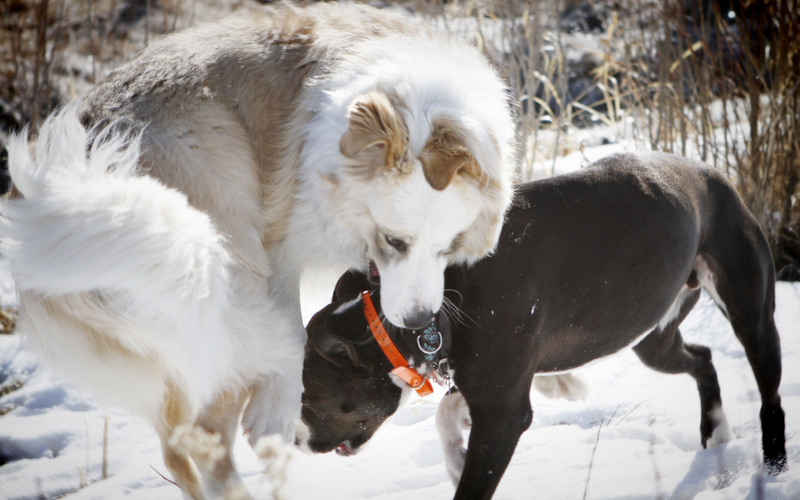 Shelly has had Kayla since she was a pup. 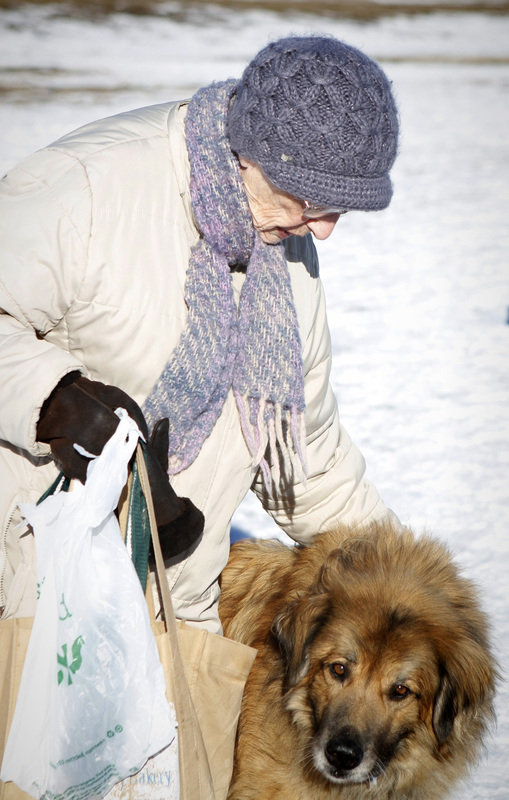 She is such a sweet, quiet dog, just happy to be out enjoying the sunshine with her person. Kayla loves to give hugs and get cuddles. Like most Goldens, she was very happy to sit quietly and get lots of attention. 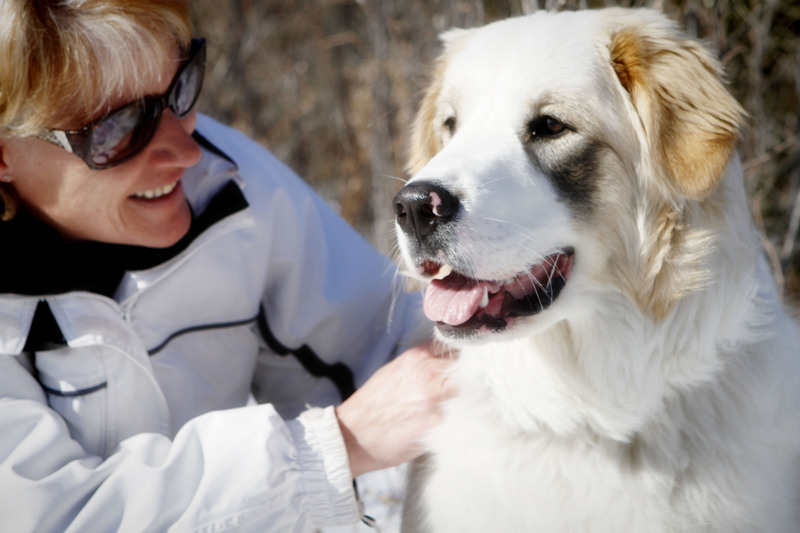 Number 32 – Meet my next new friends, 8-month old Sakara, a sweet, rather shy and cautious Great Pyrenees/Border Collie cross and her person Karen. Sakara resembled a seal pup when she was a pup herself so Karen gave her this beautiful Inuit name that means Sweet Maiden. Sakara came from a litter of nine pups! 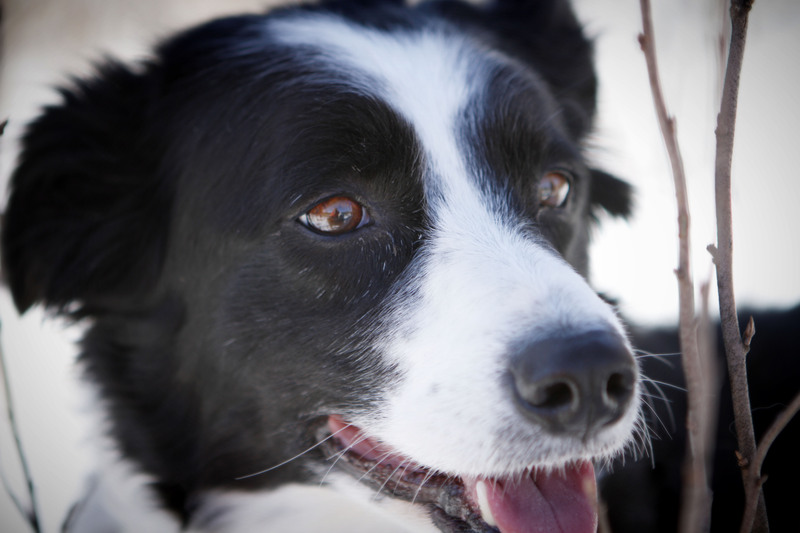 Her mom belongs to a friend and I guess a wily gentleman caller (oh those Border Collies!) snuck on to the property and that was that. All the pups have gone to good homes. 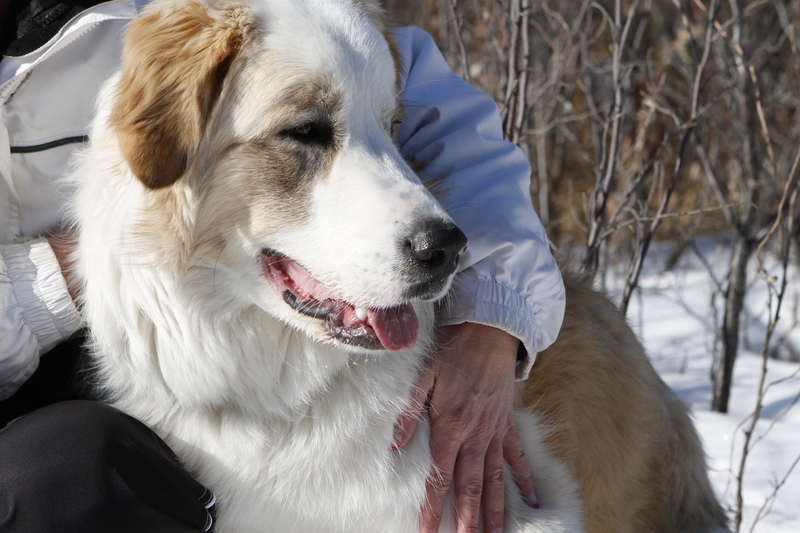 Although Sakara is shy, she likes to be adventurous (certainly a Great Pyrenees trait) and sometimes goes off exploring at the Park (good thing she doesn’t hang with my Tashi!). 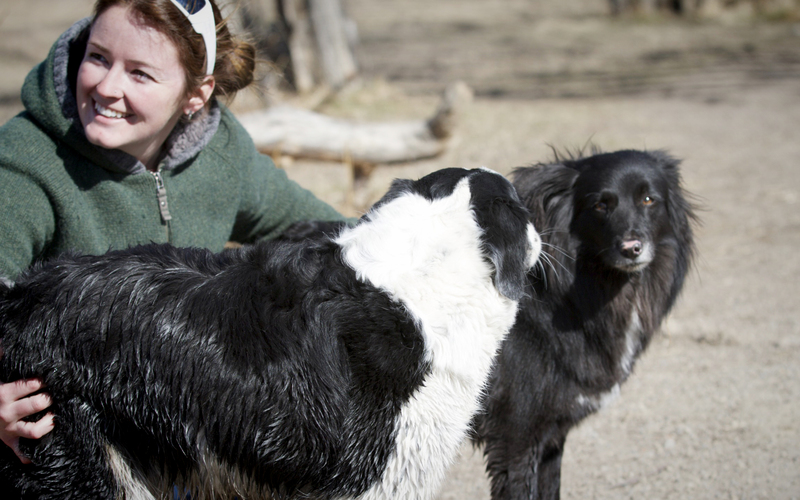 Once we stood and talked for a short time, she got comfortable and came up to say hello to us and to the dogs. 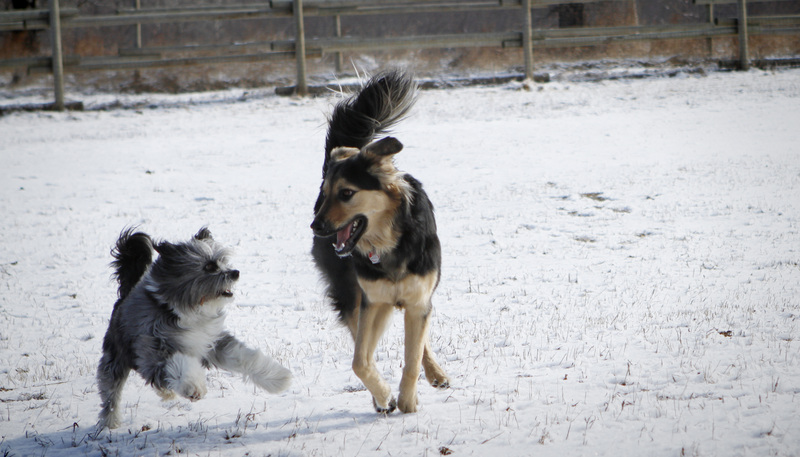 By the time we parted ways she was fully into a play session with my friend’s dog, Charlie and didn’t want to leave. 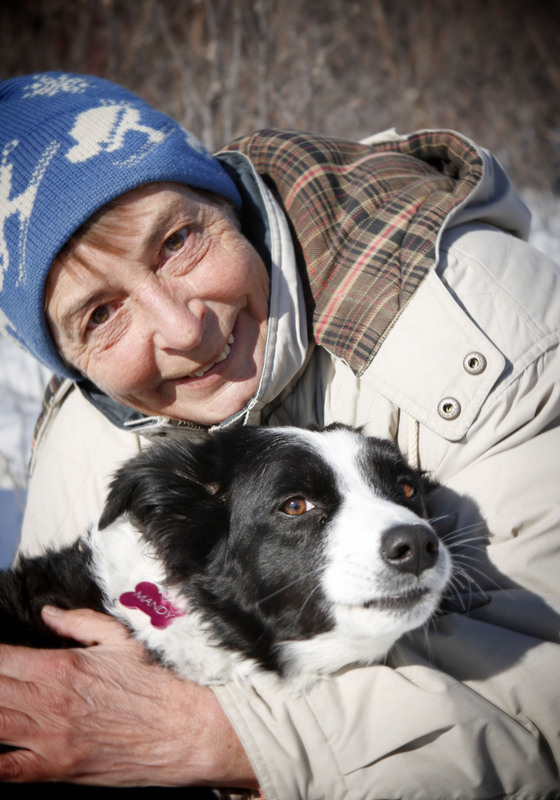 Number 31 – Meet two lovely ladies, Mandy, a 5-year-old Border Collie, and her special person, Irene. 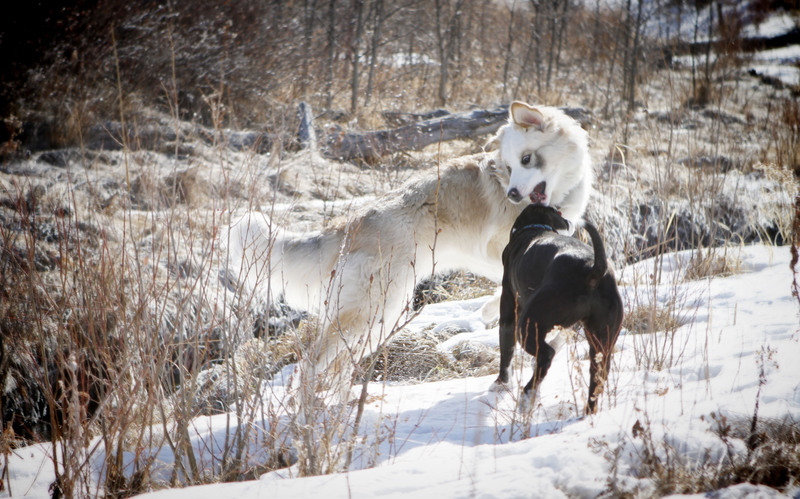 We met while they were out walking with a group of friends (you’ll meet them later) in Black Diamond at the Off Leash Area. If Mandy were a person, I kind of think she thinks she is, she would most definitely have a job as a Wal-Mart Greeter. She takes it upon herself to be the first one to say hello to everyone, dogs and humans alike. Mandy had a tough start as a pup, she was found after being shot with pellets, and somehow ended up being dropped off with Irene and her husband. I believe it was Christmas time, maybe even Christmas Day! They took her in, took good care of her and decided to keep her for their own. Irene’s husband was responsible for naming Mandy, looking at her he said it had to be a girlie one…and it is. Oh yes, and Mandy LOVES her cookies! and their people (well at least Foster’s people, more on that later), Corinne and Brian. Foster was found by some rig workers hiding out all alone in a badger hole as a pup. He was adopted by Corinne and Brian through the rescue organization ARF. The rig workers named him Foster and it stuck (it suits him). Maddie actually belongs to Corinne and Brian’s next door neighbour, a young man, who had the unfortunate luck to get in a car accident and break his hip. Corinne and Brian kindly offered to take Maddie along with them on their adventures and now I’d say she is solidly part of both families. She follows and watches Brian’s every move and looks at him with such adoring eyes. I think Foster would like Maddie to be a more permanent part of their family too, he gets quite jealous if Maddie decides to play with another dog. 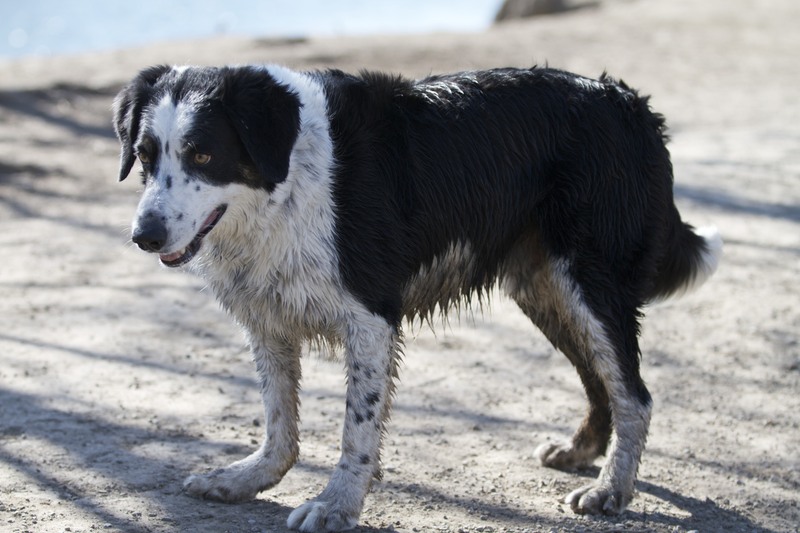 He didn’t seem to mind though when she joined in with my crew in a fun game of chase, through the mud. A good ole game of chase in the mud! Corinne and Brian must be special people because Tashi hopped up on the rock between photos to snuggle with Corinne, giving Corinne her not easy to earn, paw of approval. 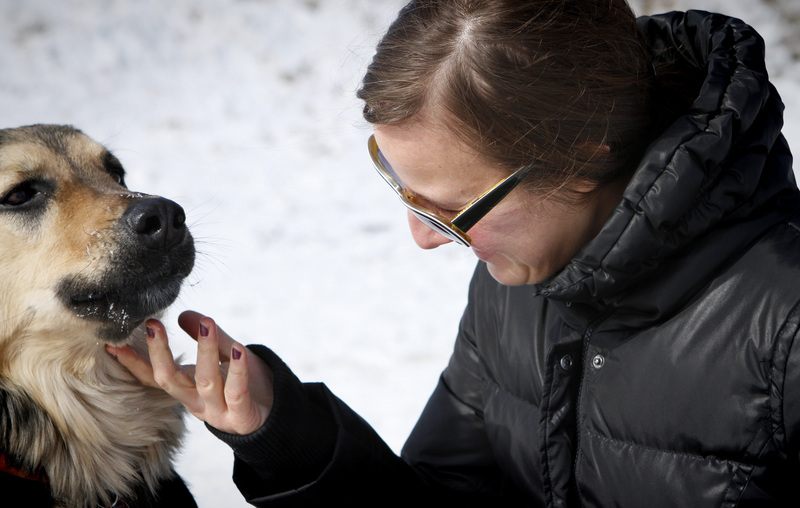 Tashi stealing a snuggle between shots – She gives Corinne her paw of approval! It was a real pleasure to meet this nice family out on our Saturday walk at the Park. 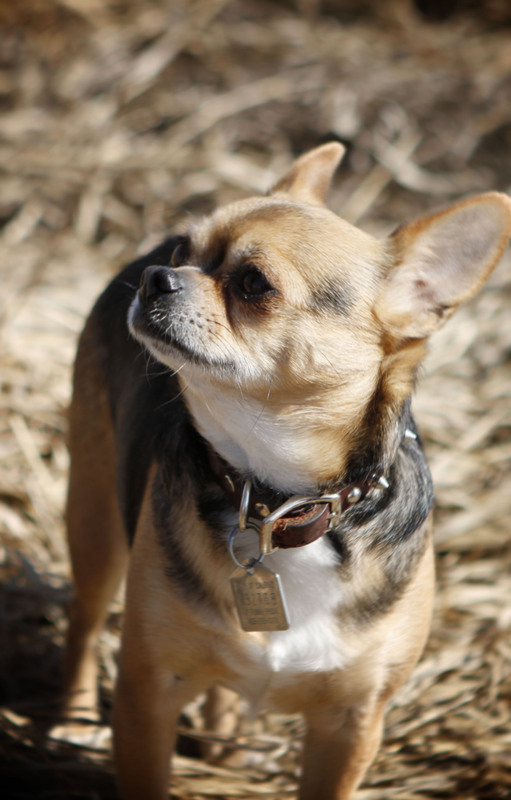 Number 27 & 28 – Meet these two adorable little Chihuahua warriors, Xena, 2, and Rambo, 4!
} 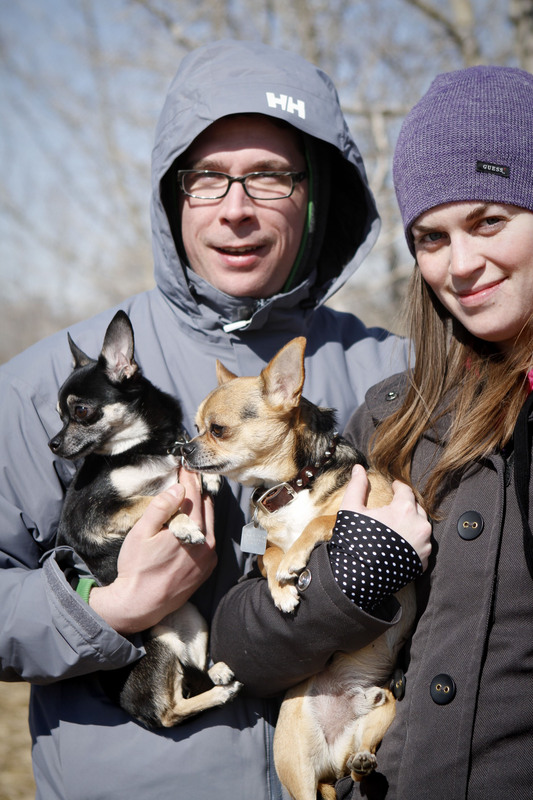 They were enjoying their first walk of the season on a windy day at the Southland Dog Park with their people, Kaitlin and Lee. Xena is quite shy and unsure with new people but she absolutely loves playing fetch with her ball. Her favorite toy is a little bear; Kaitlin and Lee will hide it in different places around the house and she loves the game of running around to find it. Rambo is a pretty laid back guy but his favorite game is protecting their yard from the Doberman that lives next door. He was a little camera shy but looks pretty handsome I’d say. They did great for their first time out at the park all season especially with all the big dogs out running. What was most obvious was they love their people and each other. 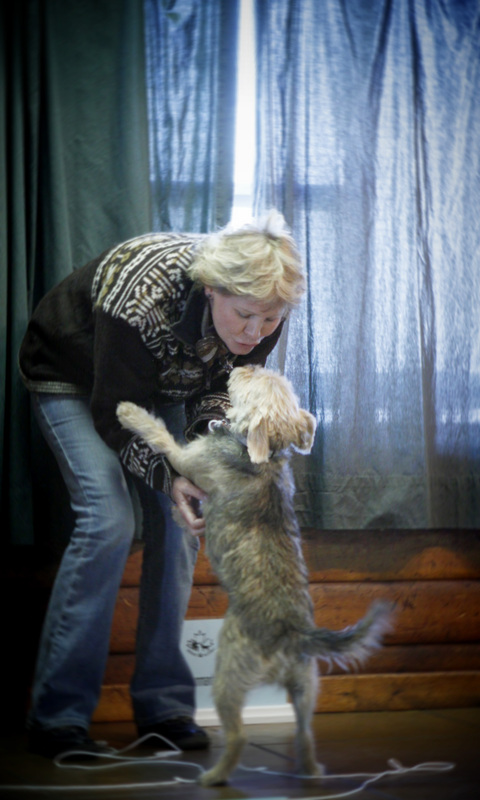 Number 26 – Meet lovely little Sandy and her equally lovely person, Leslie. 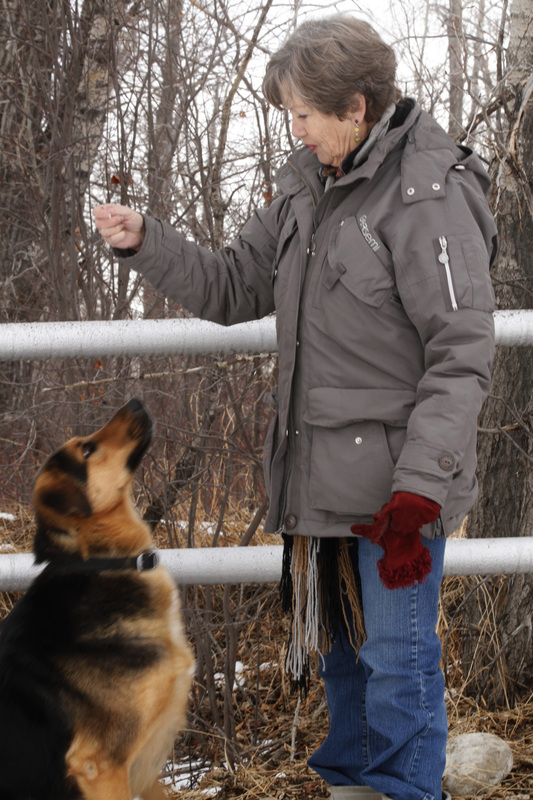 We met at a Canine Good Neighbour testing (more about that in my post) last Saturday. 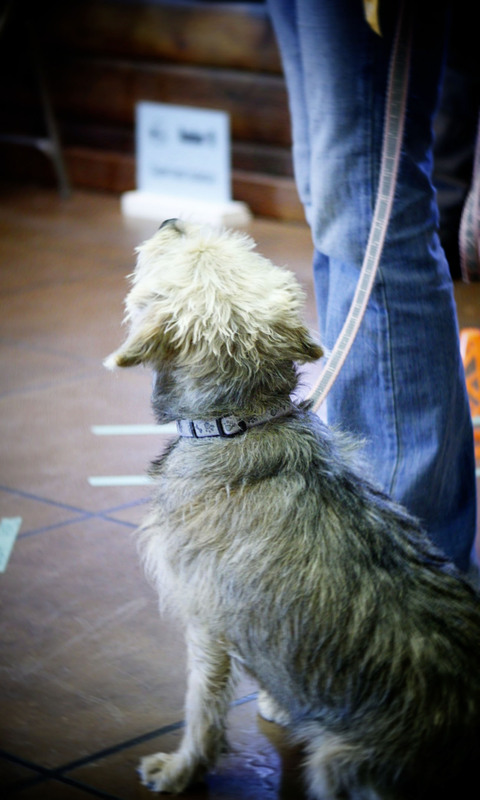 Sandy is a 3ish year old Schnauzer/Border Terrier cross. Leslie’s son and his family rescued her from a shelter in Dallas, TX, where she was surrendered by an older couple. 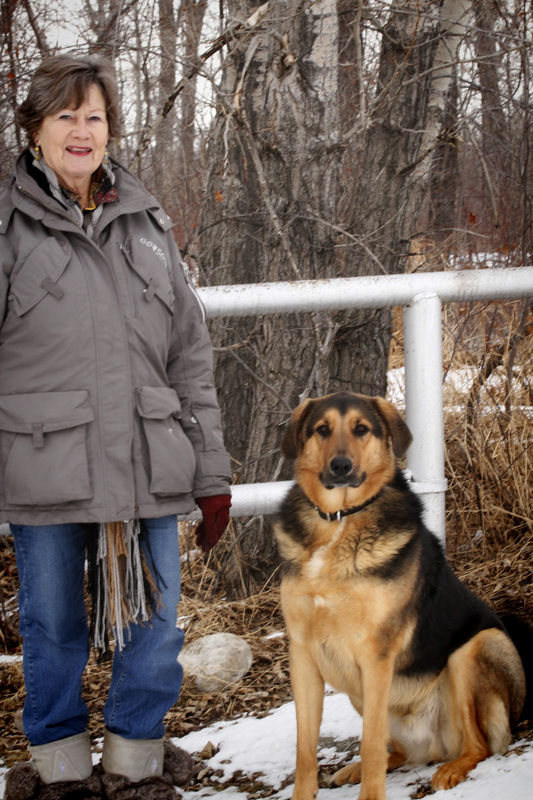 Unfortunately Leslie’s son and family had to move to Salt Lake City, UT and were unable to have a dog at their new home so Leslie said she would gladly take Sandy but it would be a one way trip….no going back to being a US citizen after becoming a Canadian girl! 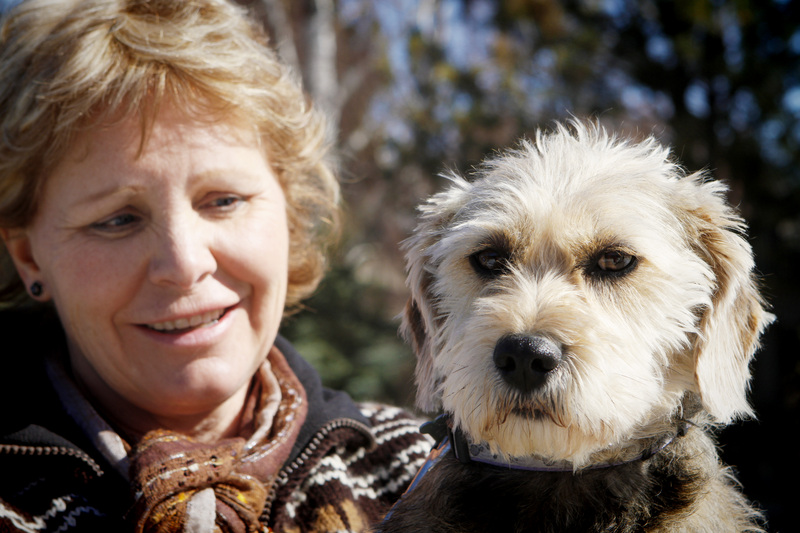 Leslie has worked hard with Sandy to prepare for the Good Neighbour test (they have only been together for 2 months). Sandy getting praise for a job well done! Leslie wasn’t sure how well Sandy would do on the test, but I watched them go through the required exercises and they made an excellent team. Leslie was visibly surprised at how well Sandy did and they only have a couple of things to work on. I know they will pass the test with flying colours next time. It was really fun to watch them work together, they have such a wonderful bond. Number 25 – This little darling is Luna, meaning Moon in Spanish, with her new people, Susie and Yuki. Luna (originally named Eboni) recently arrived from Mexico through DINO Rescue (Dogs In Need Organization). She was dumped on the side of a road at 7 weeks old, luckily she was picked up by a nice lady who took her home with her. DINO found out about her and they arranged for her to be brought to Canada. Susie and Yuki had to be patient and wait until all the bloodwork was done and paperwork completed. She is now a 9 month old little jumping bean! 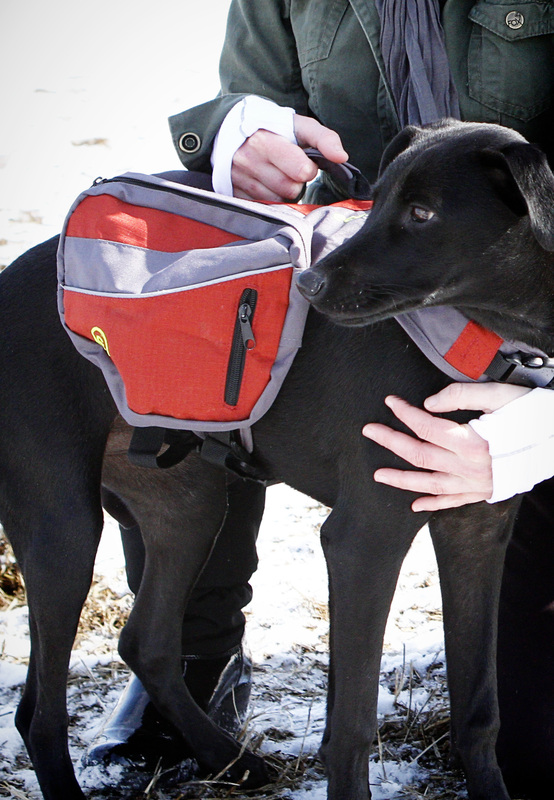 I liked that they had her wearing a backpack, it can help fulfil a dog’s need to work as well as exercise. She seemed really happy to be wearing it. It didn’t slow her down with all her running around to greet dogs and look for a playmate. It looks to me like Luna has found the right home with Susie & Yuki; and I know that they think she was well worth the wait. 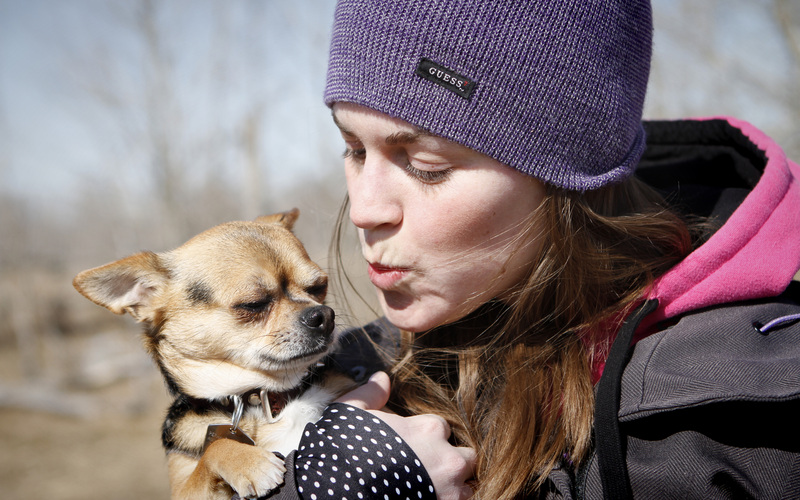 Number 24 – Meet Charlie, a two year old mixed breed pup and his adorable person Katie! 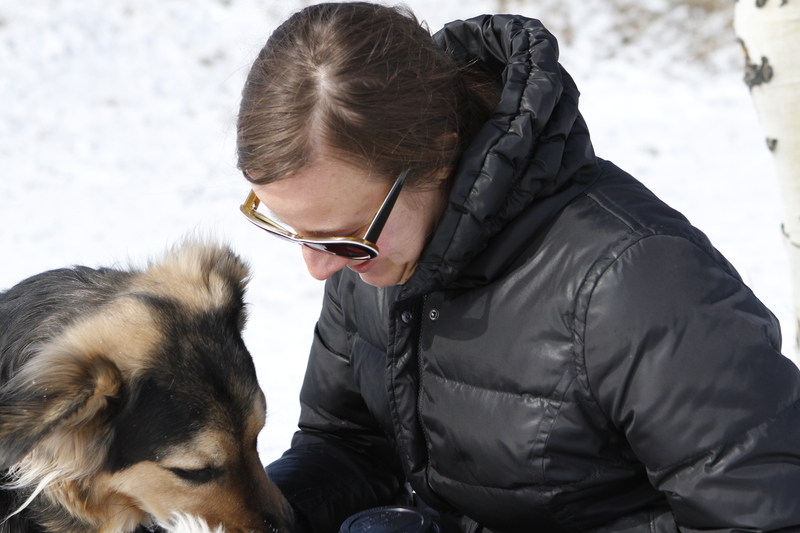 Charlie was adopted by Katie through AARCS. He was found living under a deck with his mom and siblings. The person who’s deck he was under didn’t claim to own the dogs and didn’t know anything about them, but luckily, someone spotted the pups and called AARCS. Charlie’s mom was not much more than a puppy herself. It is very fortunate that we have these amazing rescue groups looking out for these dogs and wonderful people like Katie wanting to adopt them. Charlie is a happy and content fellow, always up for a play. My dog, Tashi, was completely enamoured with him and didn’t want to stop playing so anything but a full zoom shot was almost impossible. He did stop now and then to check in with his mom and get some loving. 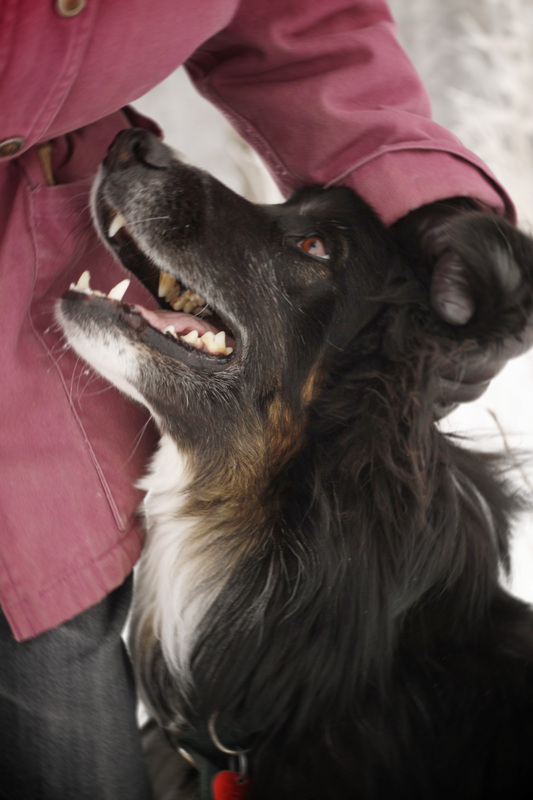 What a sweet dog he is, obviously loved very much, and the feeling is mutual. 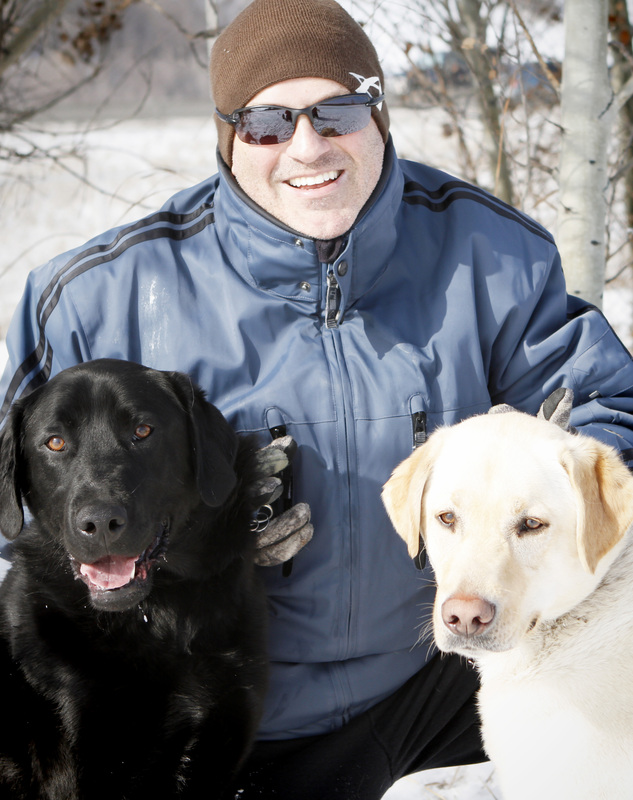 Number 22 & 23 – I’d like to introduce you to two fun guys, Baker and Lenny. 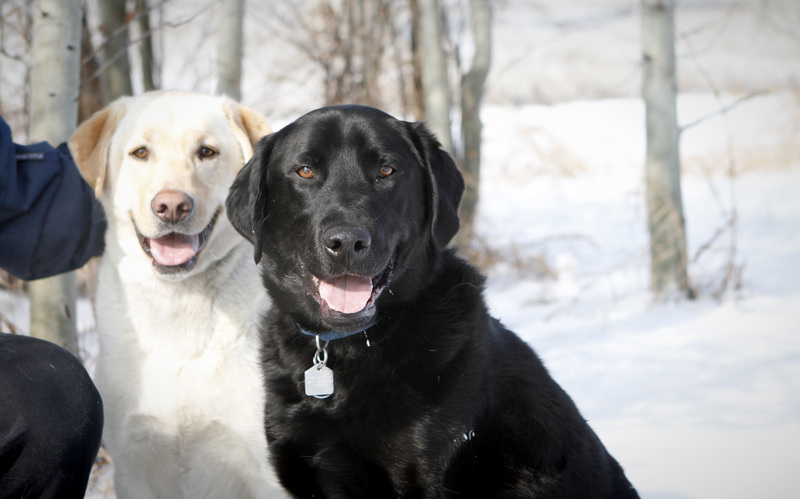 Baker the black labrador retriever is just a little over 3 years old, and Lenny, the yellow lab, his ‘little brother’ of sorts, is around 3 years old. 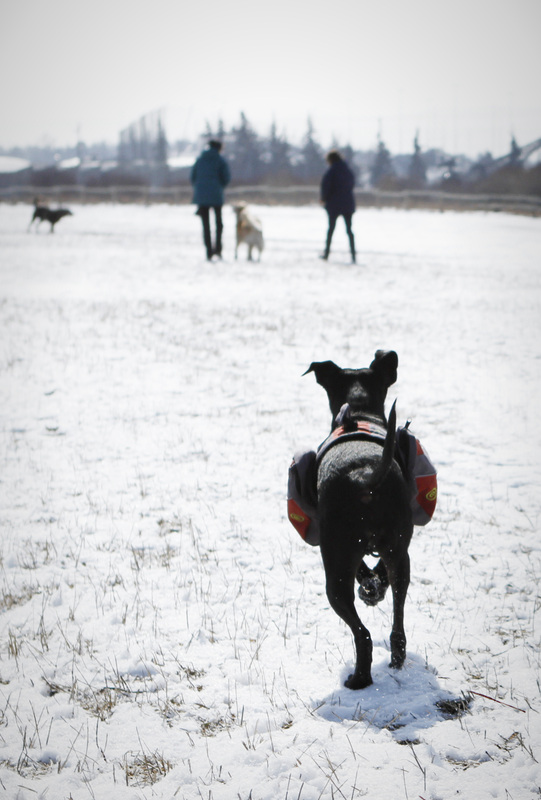 We met walking on a chilly morning last week at Southland Off Leash Park, they were both having a great time romping with their best bud, Brett. Brett has raised Baker since puppyhood. Lenny came into their lives at about 2 1/2 after a friend of a friend found out that the mom of the family was highly allergic to his fur. 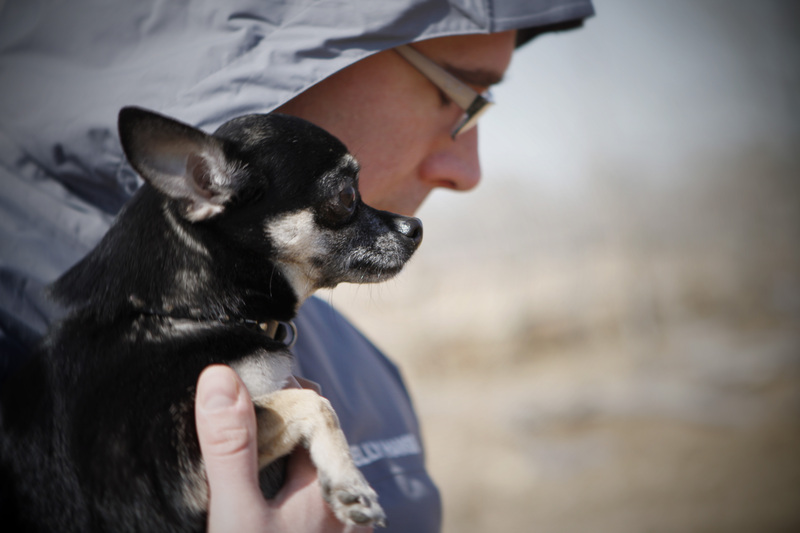 Lenny had two little girls that loved him very much and were heart broken but they had no choice; Lenny was lucky enough to find a great home with Brett. Lenny spent the first couple of weeks in his new home mopping and spending time in his kennel. He soon came around and started enjoying his new life, having fun with his big brother Baker. I’m not sure how Lenny came to named but Baker is the namesake of Brett’s good friend who passed away after a battle with cancer, that’s quite an honour. 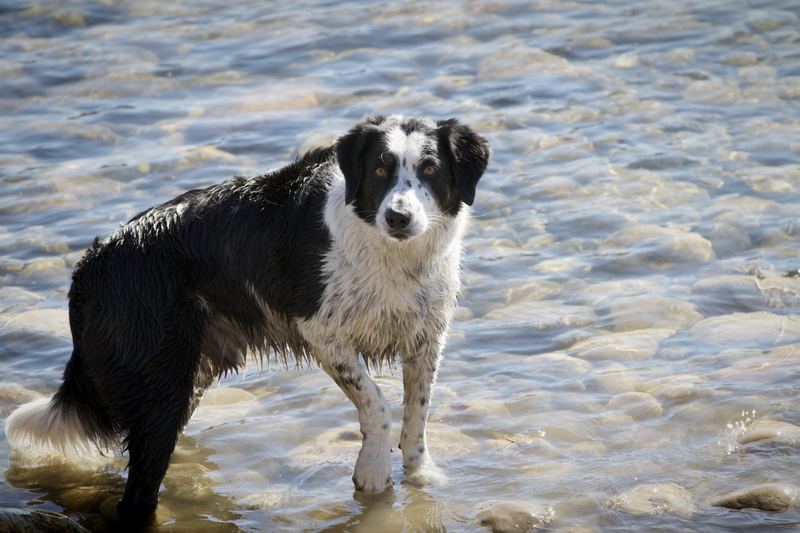 Baker loves to swim…any time, any where and any season! He likes to get out in the middle of the river, find the current and swim in place, like he’s in an infinity pool. Lenny’s obsession is playing with balls, if he doesn’t have a ball of his own he will happily find someone else’s to play with. They are both fantastic boys, good friends, and, you can tell they bring Brett lots of laughs and joy. Nothing like a Lab to make you laugh! 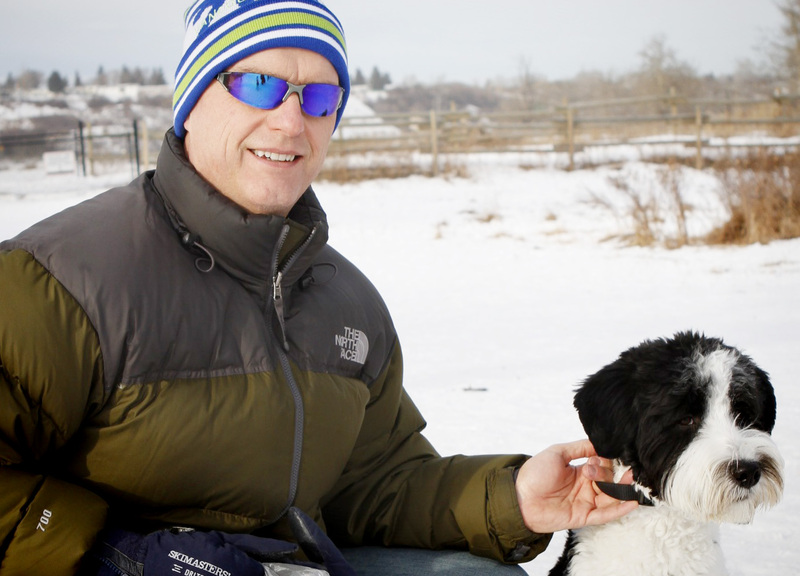 Number 21 – Jack, a 5 year old Bernese Mountain Dog/Collie cross, and his lovely owner Marg were the only walkers we met at the Black Diamond off leash area on our walk one foggy morning last week. Jack was such a sweet guy and quite happy to say hello to our pack, although it was evident he really only had eyes for Marg. 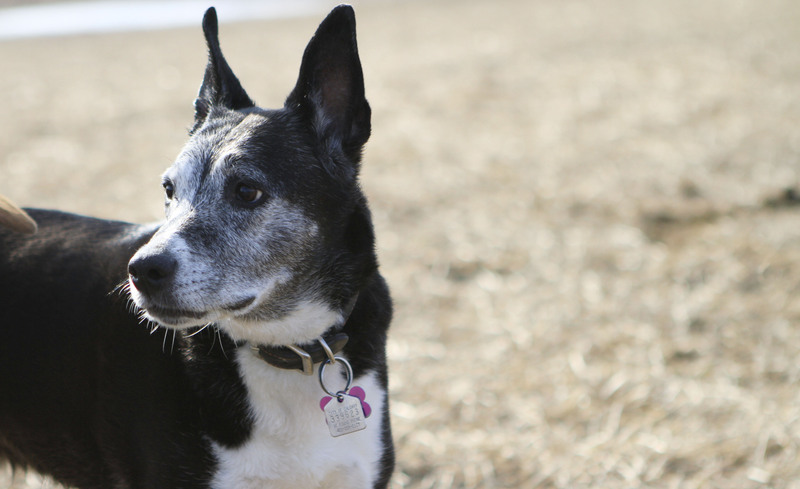 Jack spent 17 months at Pound Rescue before he and Marg got together. 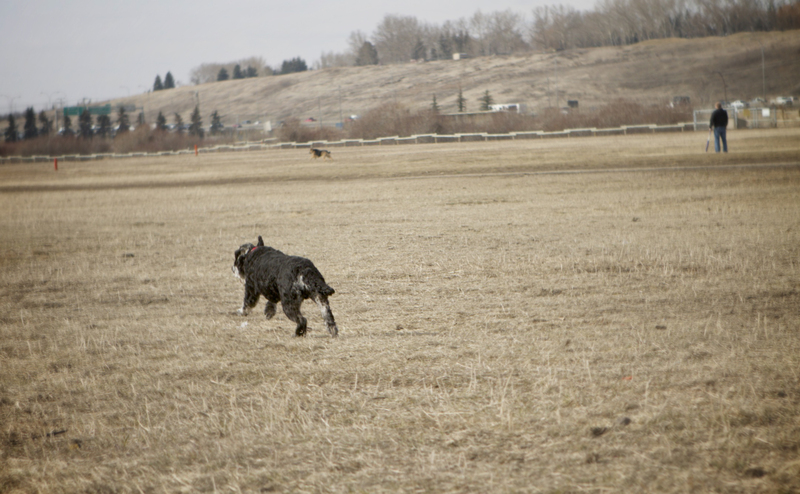 He has a great life with Marg living on an acreage out near Turner Valley. He is squirrel crazy and he loves to sit at the bottom of trees and bark at them; Jack loves the off leash area for that very reason. My dogs can attest to the abundance of squirrels out there who love to sit in the trees, chattering and teasing. Marg told me a funny story about Jack and a squirrel. They were out on a walk along the road and came upon a squirrel that seemed dazed. Rather than give chase, Jack nudged it with his nose, along the road, into the ditch, and eventually to the base of a tree. When the squirrel figured out where it was it quickly scurried up the tree. 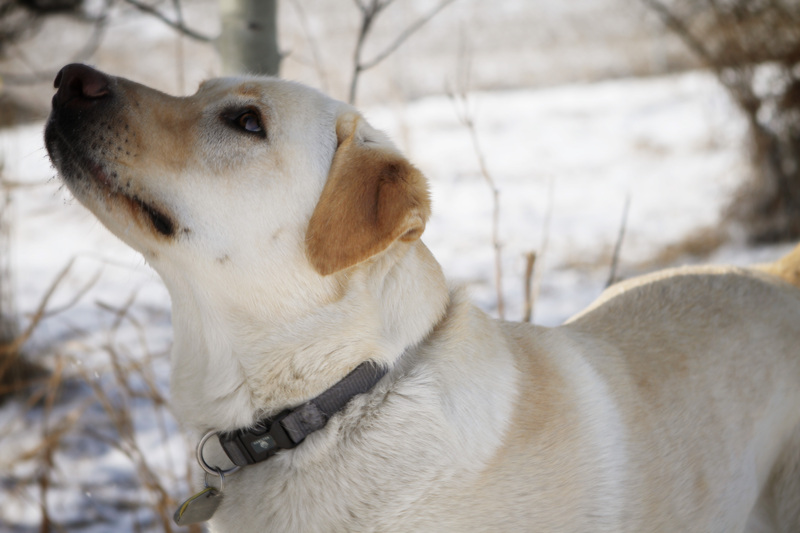 As soon as it was safely in place up in the branches, Jack sat right down at the base of the tree and started to bark. Seems like he knew the squirrel’s proper place was up a tree and not on the side of the road. Such a great guy our Jack! 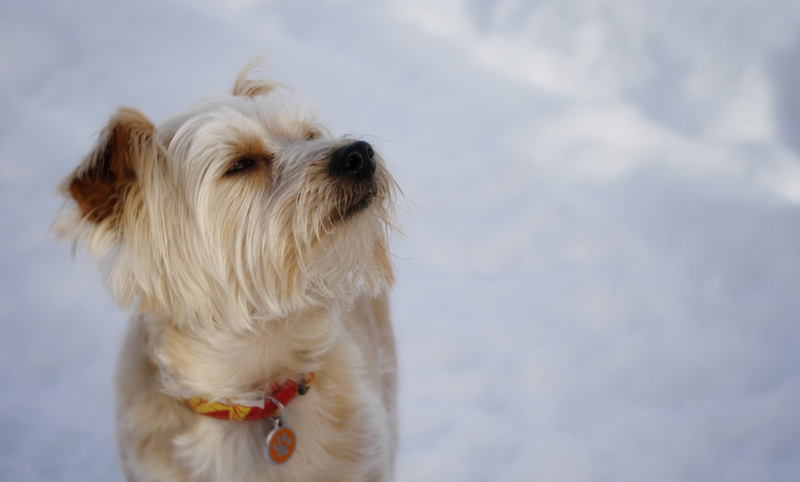 Number 20 – I had another lucky encounter at the Southland Dog Park, meeting Honey and her new best friend, of two months, Rick. 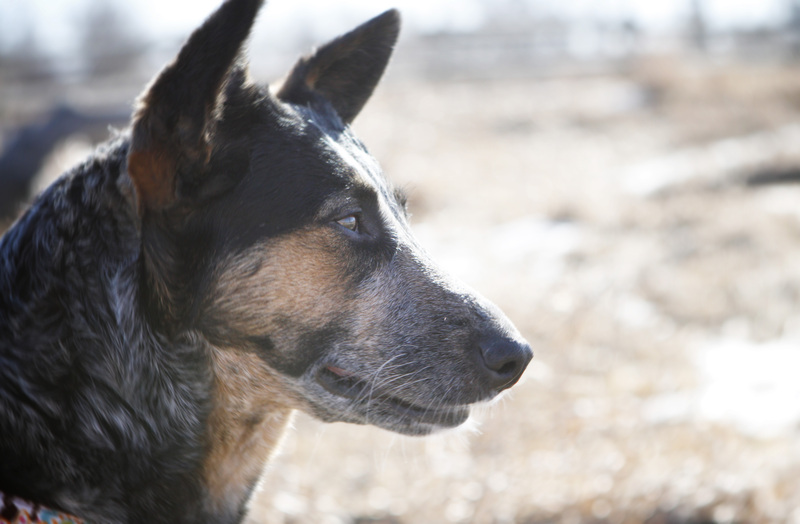 Honey is a beautiful 18 month old Australian Cattle Dog who has ‘special girl’ written all over her. I could tell from the minute I approached her and Rick, who was resting on a log enjoying the sunshine, that she had a wonderful nature. She approached all the other dogs with the hopeful, playful, respect you seldom see in a dog her age. After saying hello to the dogs, she came up to me wagging her tail, looking for a good scratch or pat. 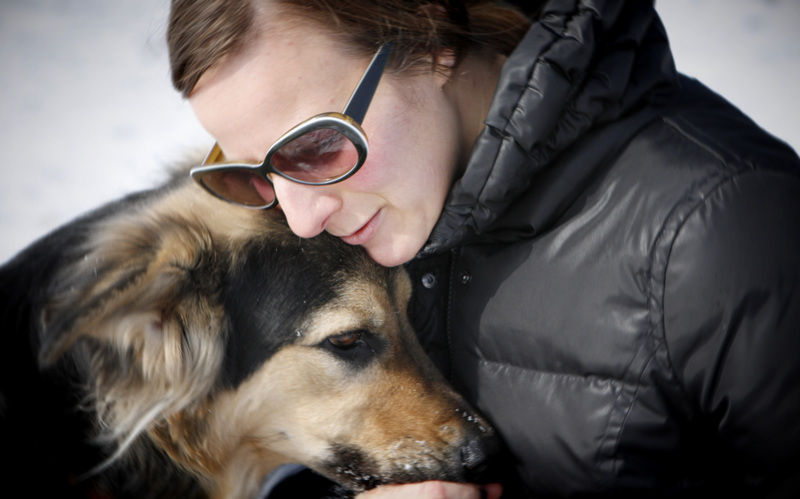 Honey showed up at a drilling rig, somewhere in Alberta, pregnant and in need of care. 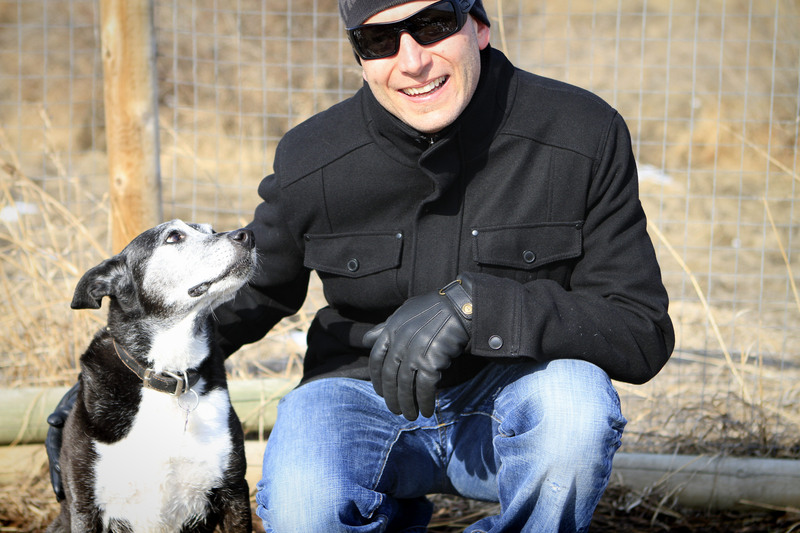 A kind person brought her to The Calgary Humane Society, where she delivered 8 puppies, and that is where Rick met her. What a calm, patient girl! He said the first week at home she spent curled up in what seemed like a little shell but with patience and love she came out of that shell and into the sweet girl she is now. Watching them together, you would swear they have been a team for a very long time; they have become fast friends. Rick said when Honey came to them her fur was almost completely grey, but, as you can see, her beautiful blue merle coat is coming back. 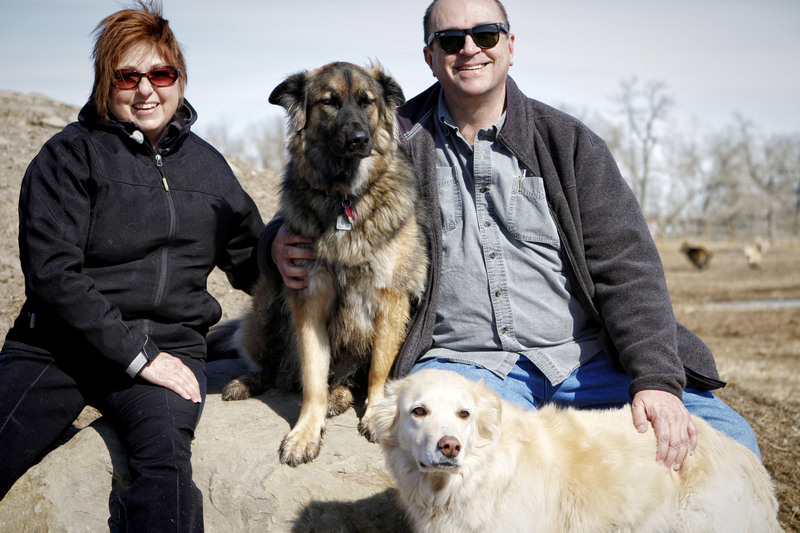 Sadly, Rick and his wife lost their Australian Shepherd, Rally (9 1/2), one Sunday morning of a very sudden and certainly unexpected heart attack. They were completely heart broken as you can imagine. 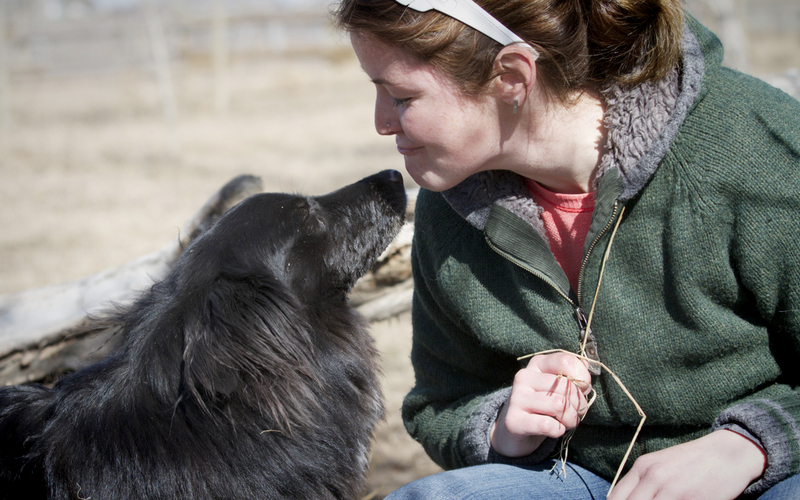 Although no dog can ever take the place of another, I do believe that Honey is fast filling that hole in their hearts. Number 19 – What a joy it was to meet these two special souls. Meet Bella, a sweet 6 1/2 year old Bassett Hound and her special person Dulcie, who is also very fondly known to all the regulars at the Southland Off Leash Park as “the Cookie Lady”. 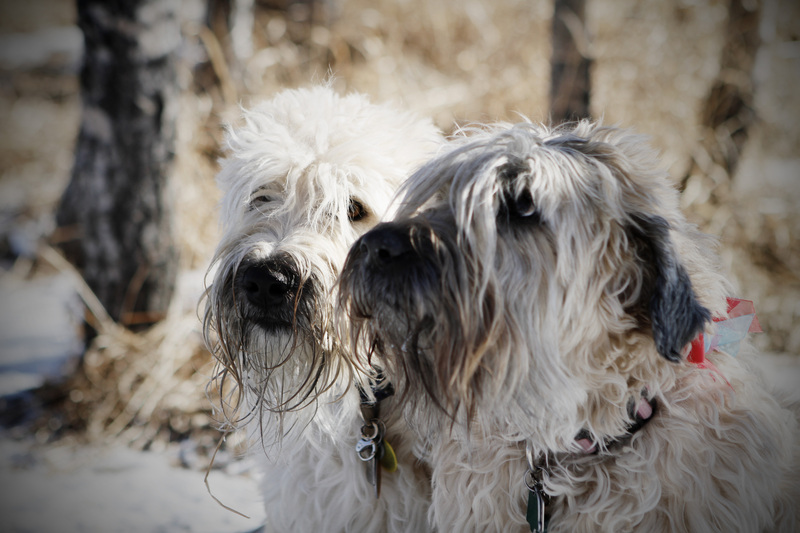 It was difficult to get a photo with just Bella & Dulcie together as dogs had her surrounded and even came running from across the Park to say hello, get a scratch and perhaps…a cookie. This fella bounded across the field to say hello to Dulcie. What I forgot to mention up front us that Dulcie is 86 year old! Seeing her out with Bella makes me “tsk tsk” at all the people blaming cold weather for not walking their dogs. Bella was rescued along with her brother from the US several years ago; Dulcie’s daughter found Bella through the internet. Dulcie could only keep one dog and I’d say she picked the right sibling, what a lovely, easy going pup she is. Bella getting some cuddles herself. Several people I met at the Park spoke so fondly of Dulcie and said she had been coming to Southland and handing out cookies since the Park opened. I’m not sure how long that has been but I have been walking there on and off since I had my first dog Seba and she would have been 14 this year. All the dogs seemed to sense that they should be gentle and not jump on or knock over Dulcie, it was something to watch. 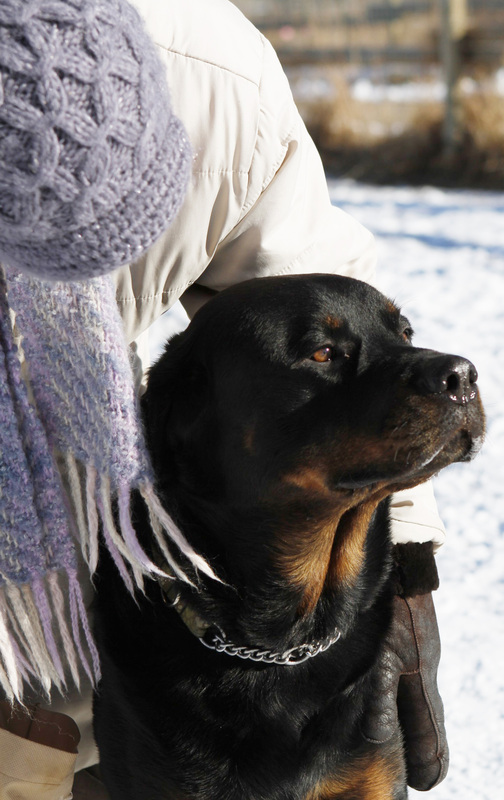 Hector, a Rottweiler was very taken with her and she with him, so cute. The meaning of the name Dulcie means ‘sweet’ and Bella ‘beautiful’ and I think they both fit perfectly in this case. 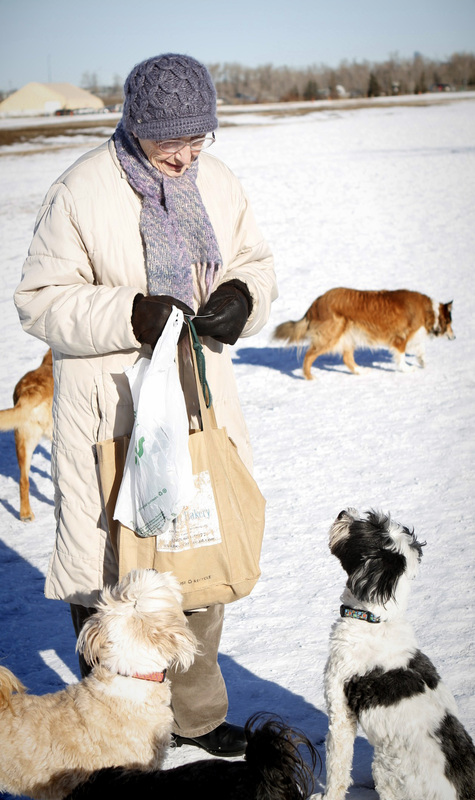 What’s funny is that Bella only takes treats from Dulcie at the Dog Park, never at home. Dulcie and her husband used to have German Shepherds and Rottweilers during their marriage together, now Bella is keeping her company and keeping her young. 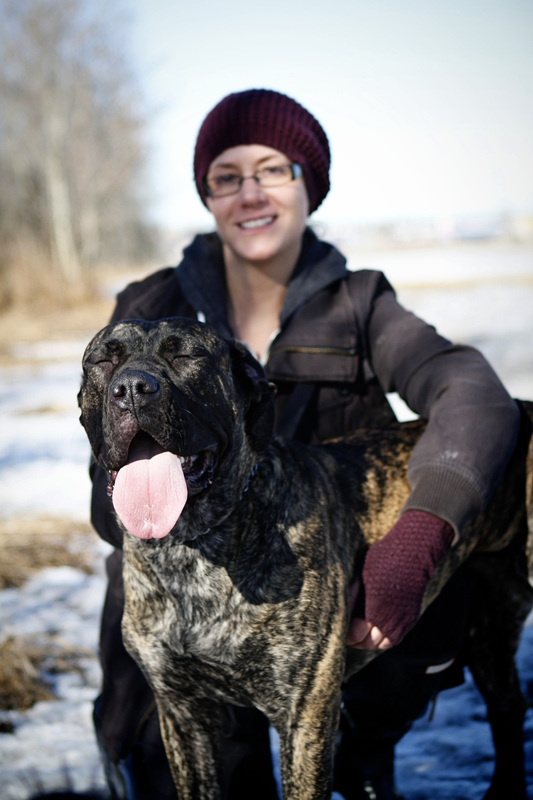 Number 18 – I met Presa and her person Jessica towards the end of our walk. She is one big puppy, not full grown yet for sure at only 16 months old. 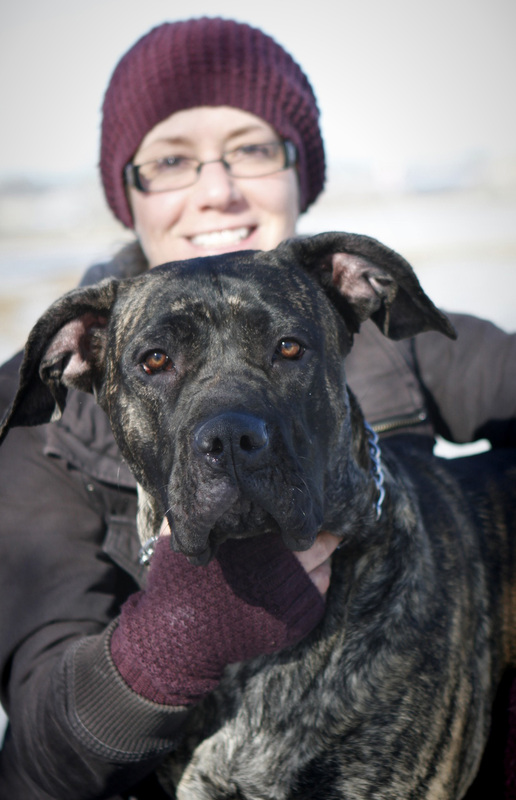 It was hard to get Presa to agree to sit for a photo as there were lots of dogs around willing to run and play with her; in fact there was a little bit of wrestling involved to get her to sit for a couple of minutes. 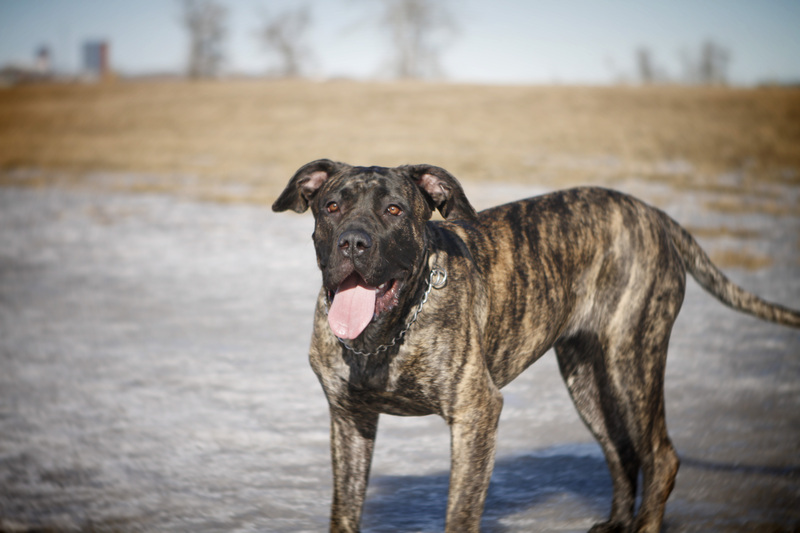 She is a Presa Canario, a breed originally from the Canary Islands, Spain and bred to work livestock. Presa Canarios are of strong character and can be dominant but with early socialization and training they are fantastic, loyal dogs. It sure looked to me like Presa was pretty social and a happy girl. Jessica was going to call her Tiger but thought the first word of her breed name was pretty and unusual so she decided to call her that instead; I think it suits her as she is definitely a rare beauty. Number 17 – Meet Penny! 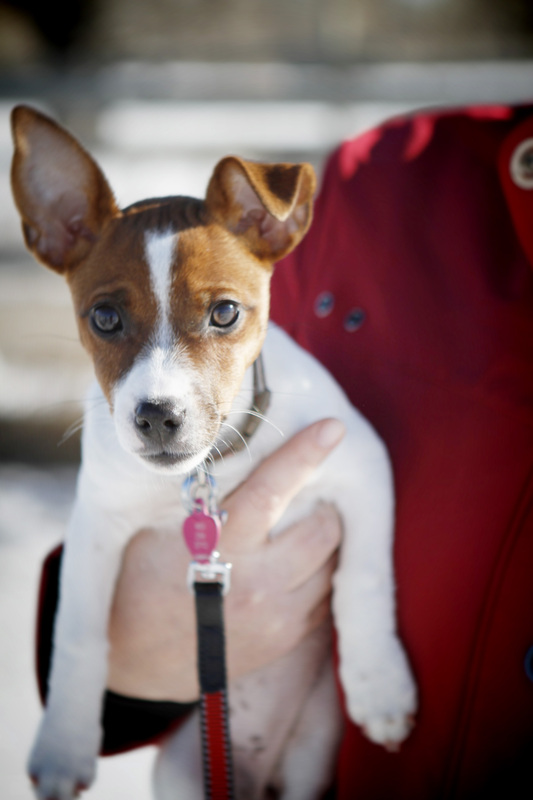 She is a 3 1/2 month old Jack Russell Terrier and today was only her second time at the dog park. Her ears were so adorable, they seemed to have a life of their own. 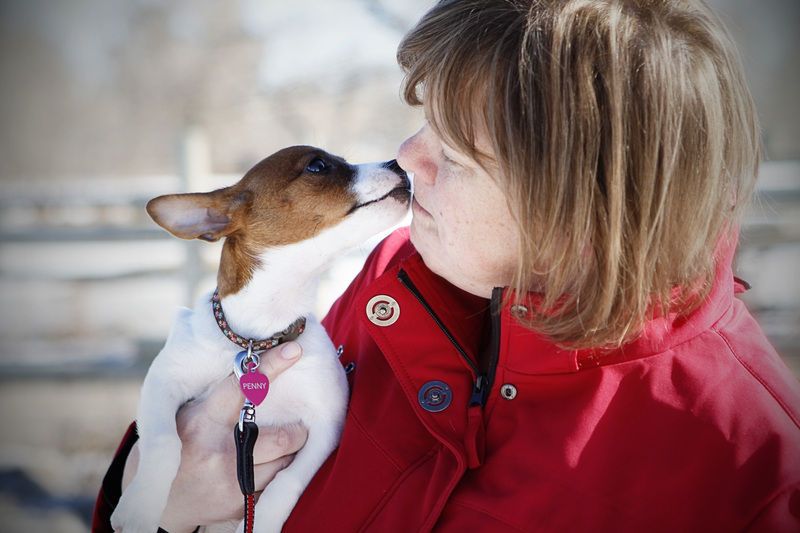 Penny sure seemed bonded already with her person Kathy and she loves giving kisses. I love that Penny’s family named her after the character from The Big Bang Theory, they figured they would be called her name…ALOT. 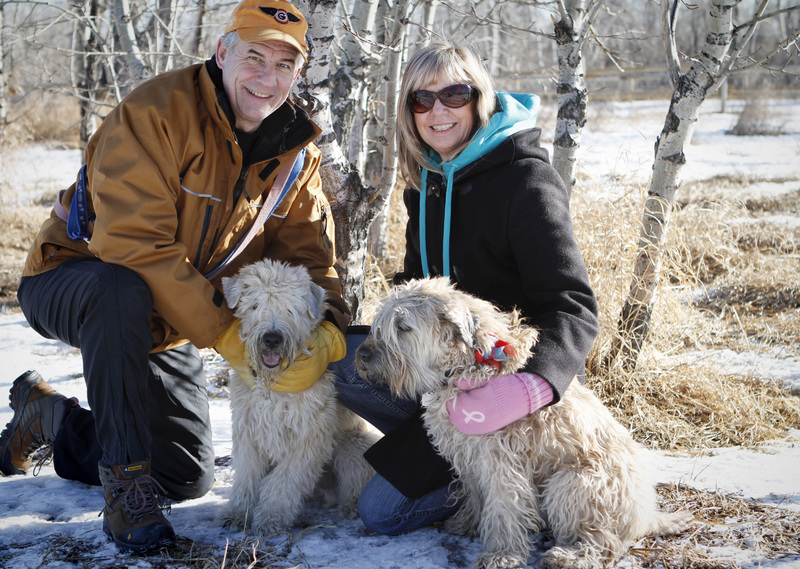 Number 15 & 16 – These two adorable Soft Coated Wheaton Terriers, Shayla and Brody came trotting up to me on the pathway at the Southland Dog Park last weekend. They were just so sweet and friendly I had to convince their people, Patti and Brian, to let me take their photos. 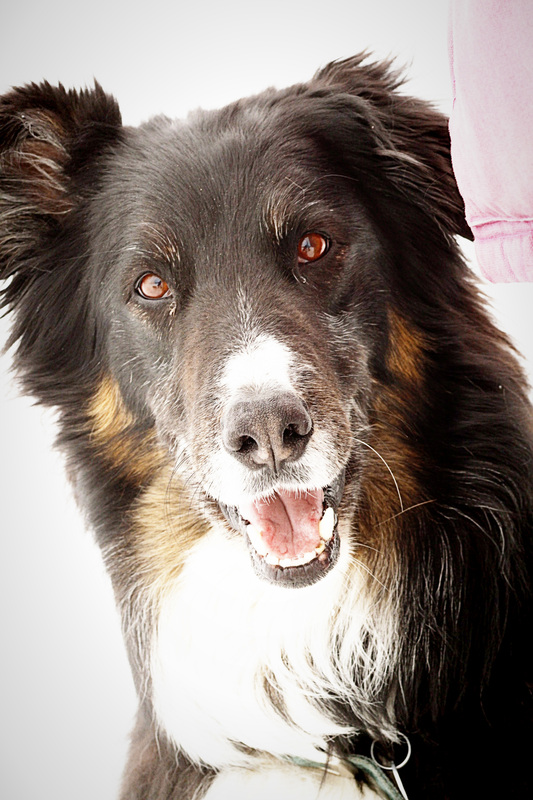 Brody, being 3 was very lively and puppyish still and Shayla, 13 was reserved with a ‘been there done that’ attitude. Shayla had a lot of fun as a youngster with their 3 boys, riding in wagons, skateboarding, etc. Her favourite food is cheese. Shayla has had some health problems of late but she sure seemed happy on Saturday and I think having Brody around keeps her young. Patti and Brian waited a long time to get a Wheaton, they had a little Bischon before Shayla came along. I’d say these two pups were worth the wait. 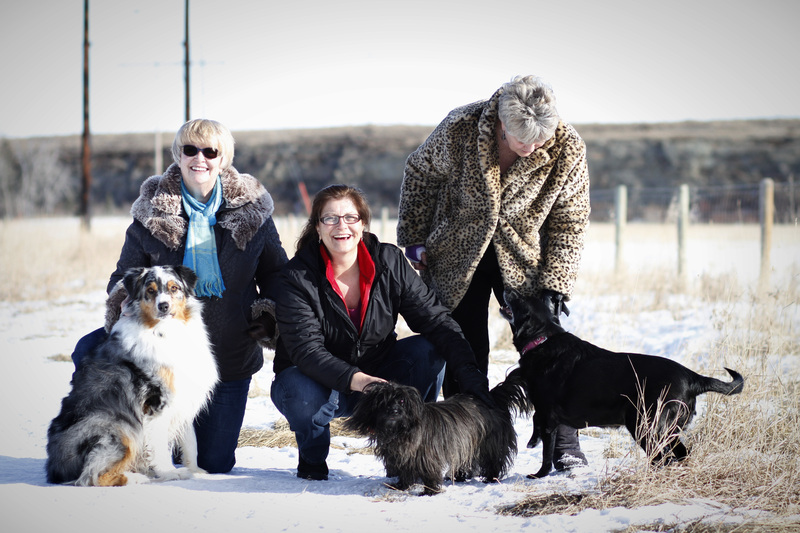 Number 12, 13 & 14 – I met this great group of ladies, who were obviously good friends, and their dogs out in Black Diamond the other day. I thought we’d try for a group shot this time although Shorty (the 12 year old black lab cross) seemed to be having a discussion with her owner Diana about it. Henry, the 10 year old Cairn Terrier kept coming over to see if I needed assistance so we just went with what we got. Jinx, the Aussie seemed quite content to sit and look handsome for the camera (he seemed to be an experienced poser). Diana (far right) belonged to both Henry and Shorty; I had said hello to them a few times out at the park but we never really had the chance to talk. 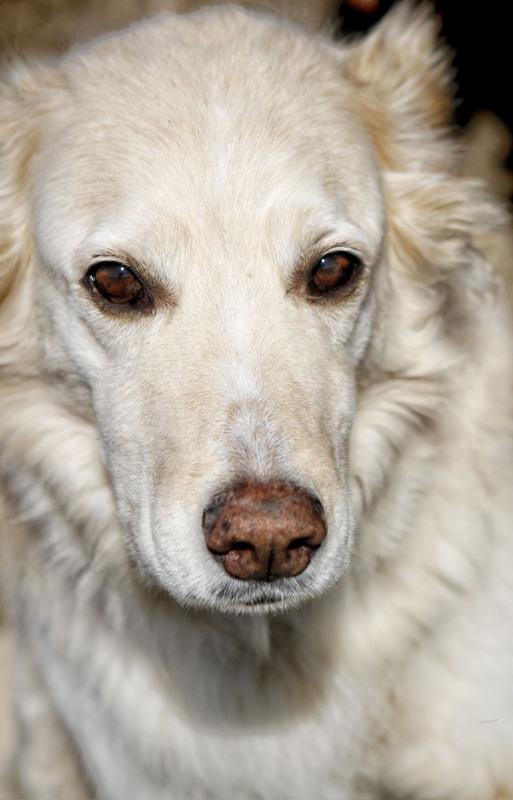 Diana looks for dogs that are older and no one else really wants and gives them a good home. Henry is named after the famous British heavyweight boxer Sir Henry Cooper. 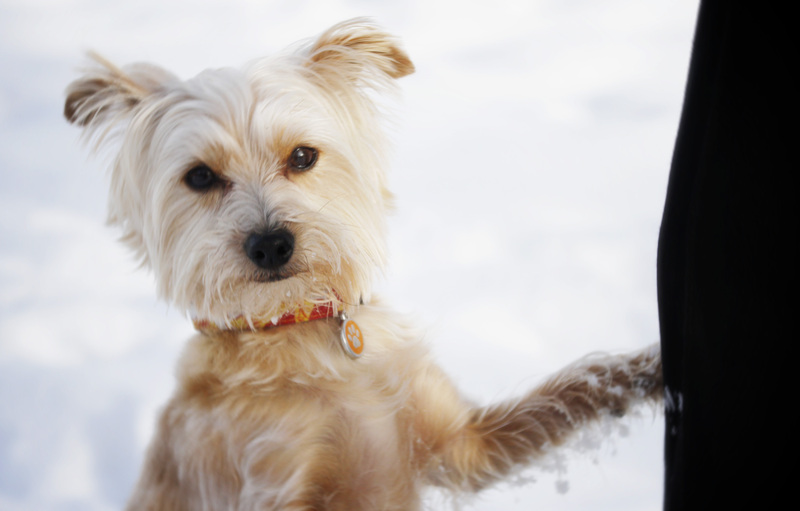 Henry is a friendly little fellow and loves to come up and say hi to all the other dogs. Shorty is a little more standoffish and doesn’t suffer fools well (smart girl); she was called Shorty because when they got her she was so tubby that her legs looked extremely short, not so much anymore with all the wonderful walks she gets. 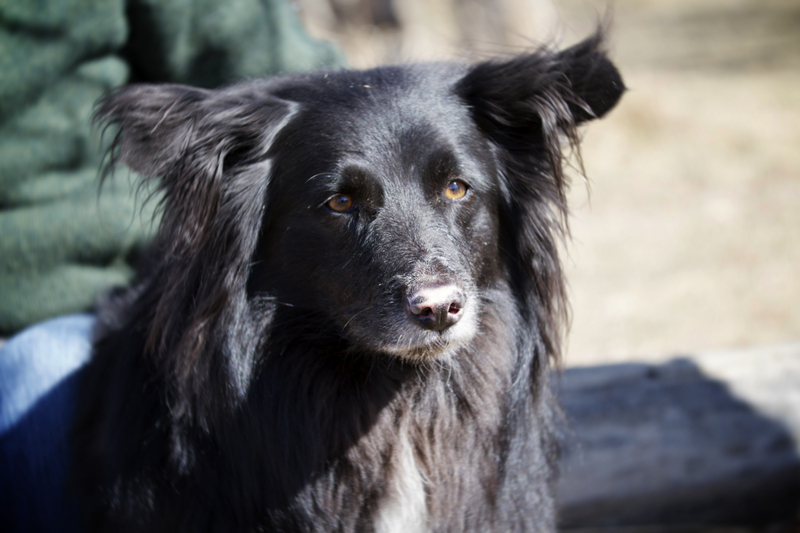 Jinx, 6, was adopted through Aussie Rescue Canada last fall by Penney. He is a wonderful boy and his original show name was Outlaw’s Lets Get Jiggy With It. Penney (far left) was still mourning the loss of her sweet Italian Greyhound, Caid, who she had to put down the week before at the age of 13 1/2. 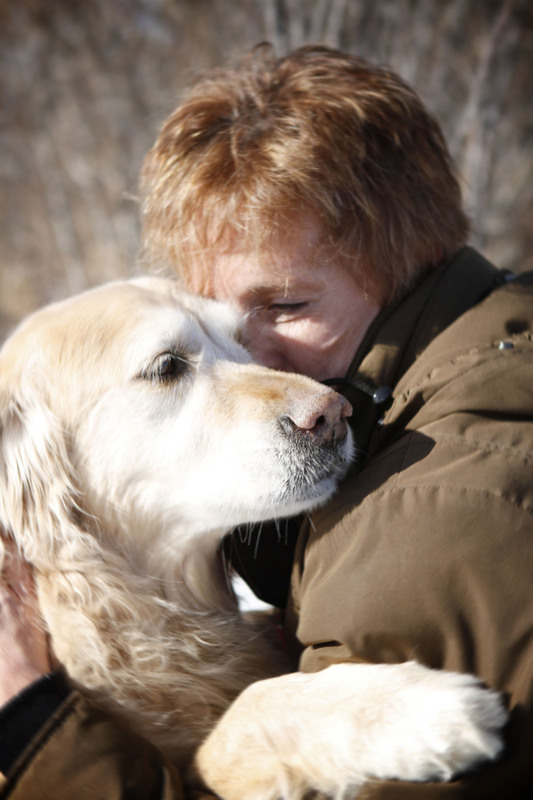 No matter what the reason, it is never an easy thing to say goodbye to a trusted and loyal friend. I am sorry for your loss Penney. Brenda (middle) was not able to have her chocolate lab (who is 16!) 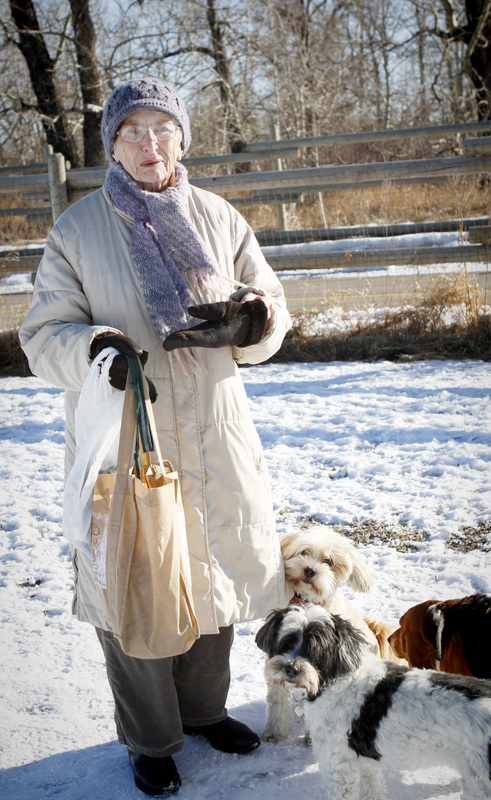 out with her as he has difficulty getting in and out of her vehicle but you could sure tell she enjoyed walking with her friends and their dogs. 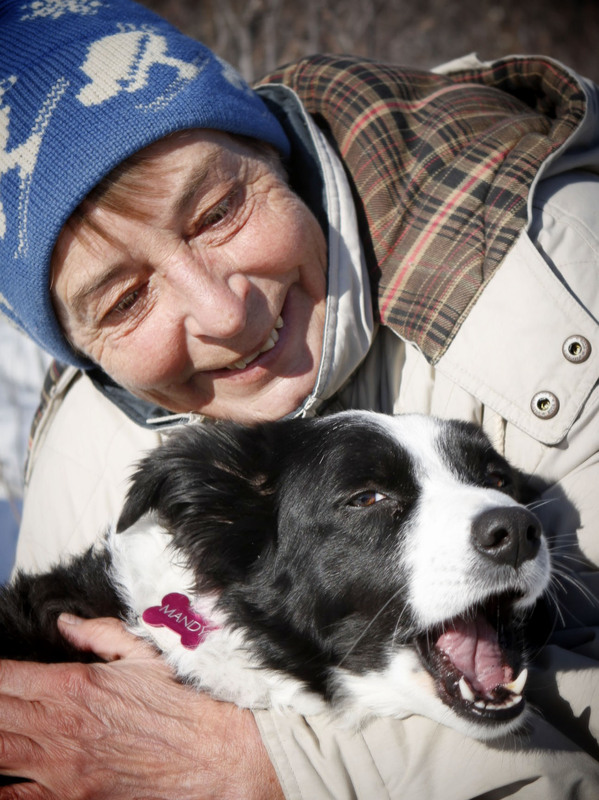 These ladies exude a dog loving attitude and their four legged friends are so lucky to have found each and every one of them. Number 11 – My oh my this little fellow just made my whole day! This is BB, named after BB King by May, the owner’s husband who is a musician. 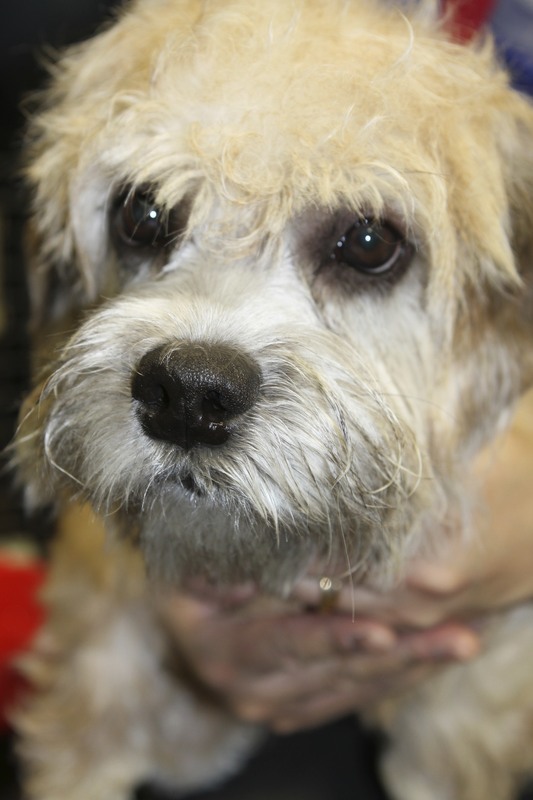 He is a 6 month old Dandie Dinmont Terrier. They are a scottish breed of the terrier family with a very long body, short legs and a very distinctive ‘top-knot’ of hair on the head. He just had such a cool, old soul air about him, sweet as sweet can be. 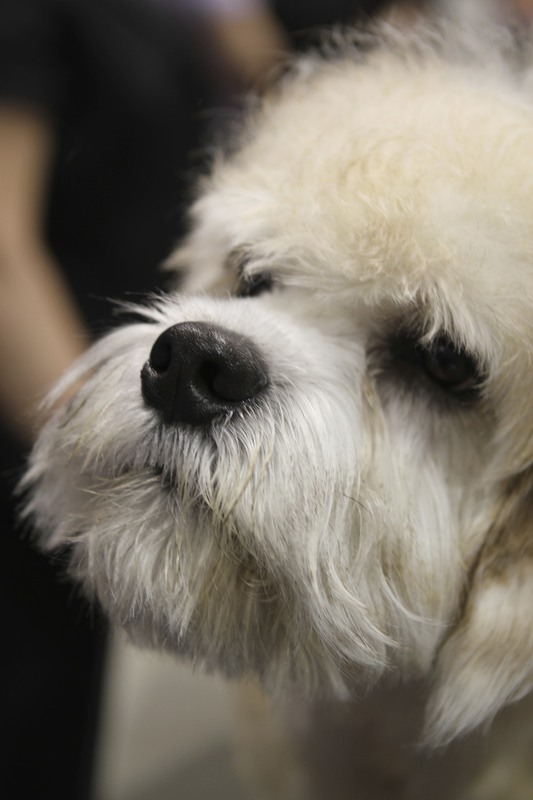 His owner, May, fell in love with the breed has a number of them at home. She had BB’s sister there to show as well although May is not her owner; her name was Orangina and her ‘top knot’ was not as pronounced yet. I felt kinda bad as she was snoozing away after just being bathed and she hadn’t had her turn on the table yet to be groomed. Orangina (fresh from the bath and not groomed yet) and cute as a button too! 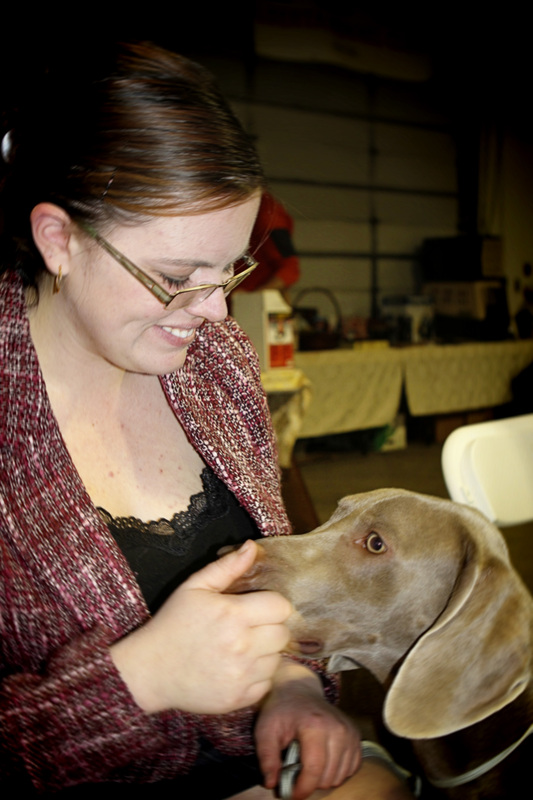 Number 10 – While I was watching some of the show in met Sako, a 14 month old Weimaraner and his owner Lindsay from Cold Lake Alberta. 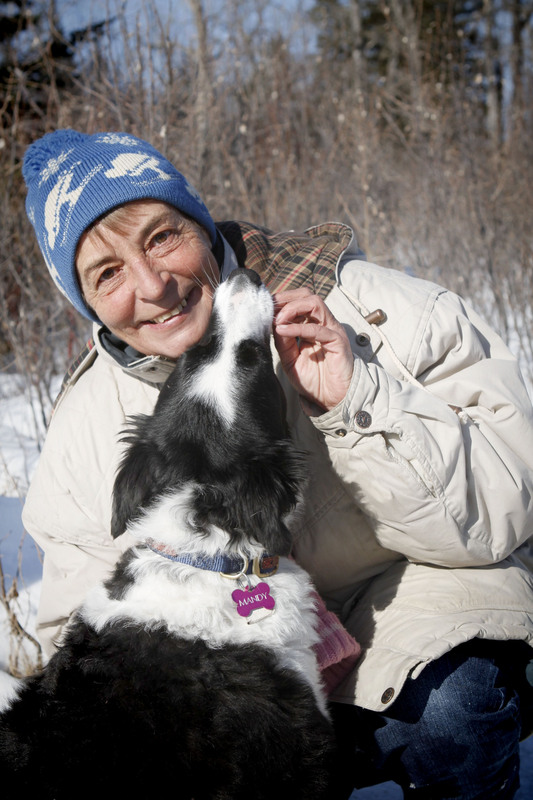 We had a great chat and she told me lots of stories about how he runs with some of her other dogs (all adopted from the local pound where they would have been euthanized) on a 4 dog sled team. She showed me some video of him running and let me tell you, he was having the time of his life. I shouldn’t really have been surprised by this as the Weimaraner is a dog with great stamina and power. They are a very old breed type dating back to the 13th century and excel in various types of game and hunting skills. While we were chatting he tried his best to convince his mom and me that he should really be a lap dog. He was incredibly friendly and sweet. 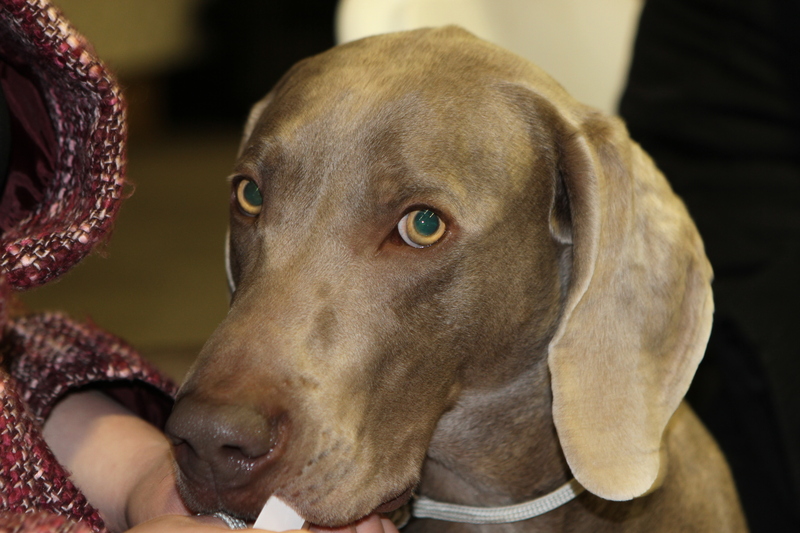 The Weimaraner was also made famous by William Wegman with his humorous dog photography, art, books, calendars and Sesame Street appearances. 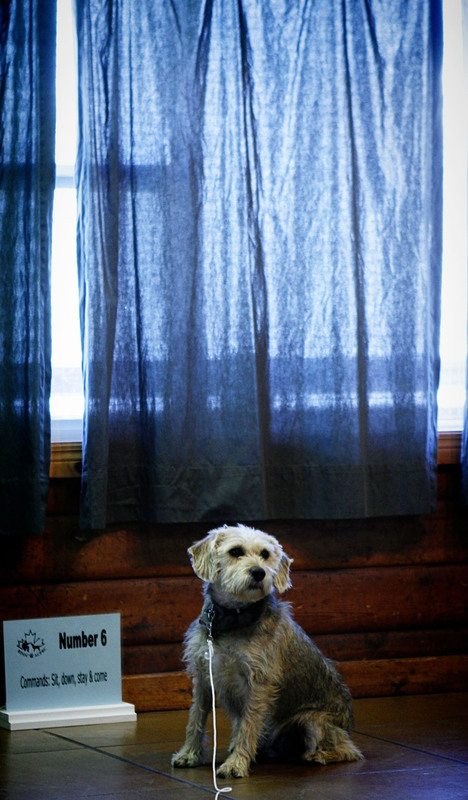 Number 8 and 9 – I met this confident young lady and her dogs at the show as well. First I met Envy, a 9 month old American Cocker Spaniel who just loved her mom Cassidy. 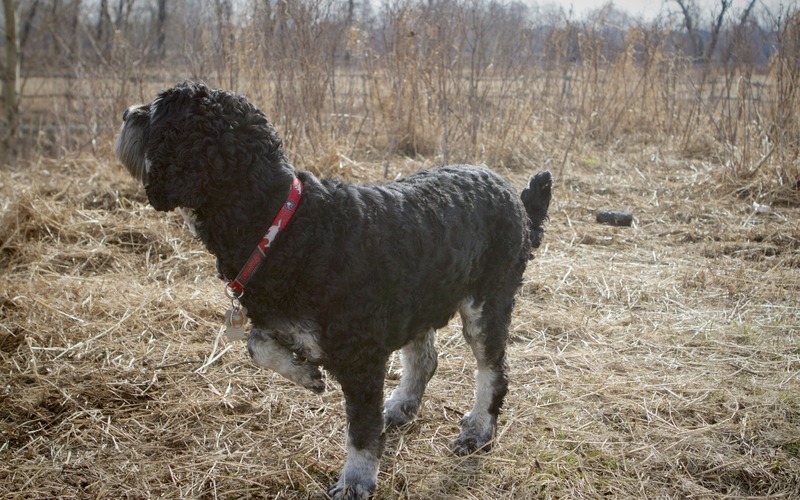 The American Cocker Spaniel is smaller than the English Cocker and has a more profuse coat. 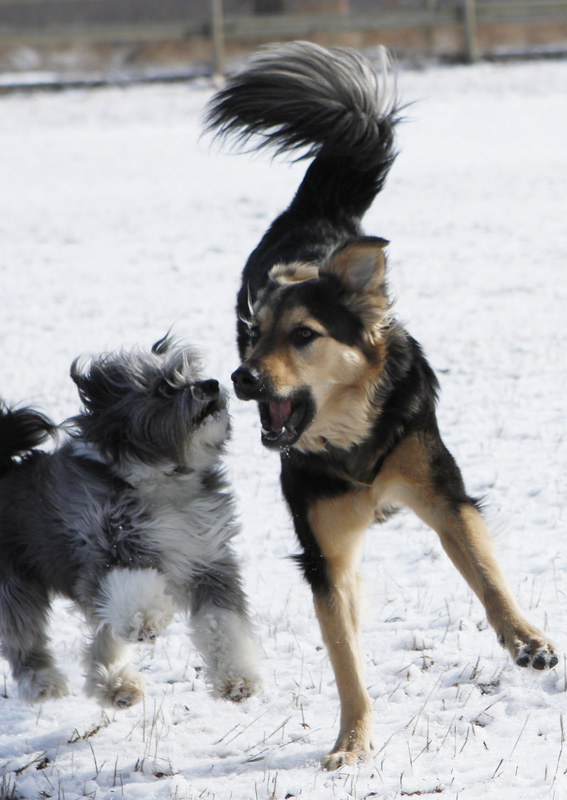 Envy certainly showed the temperament of the breed being very outgoing, social and happy. 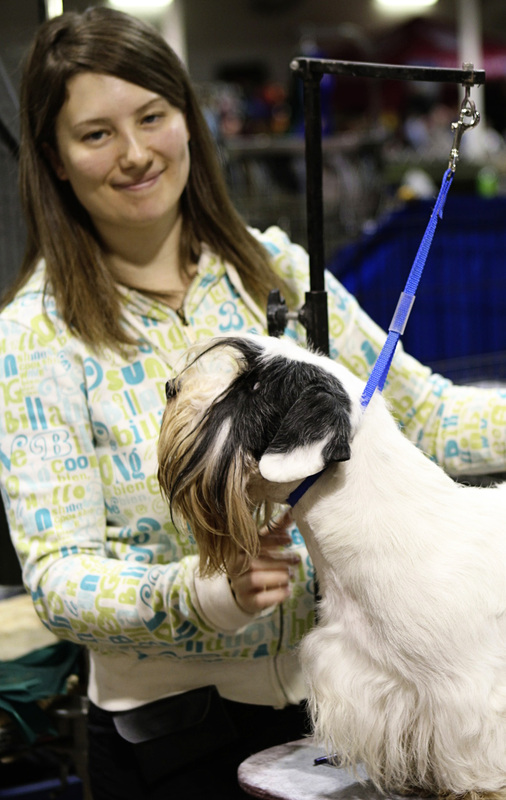 Cassidy is a seasoned dog show professional having ten years of show experience under her belt! She started at the age of 4 and showed such confidence and professionalism, it was inspiring. She really loves her dogs; Envy was so excited and loved giving her mom kisses. The other dog I met that Cassidy was showing was Static. He was an incredibly handsome Siberian Husky. 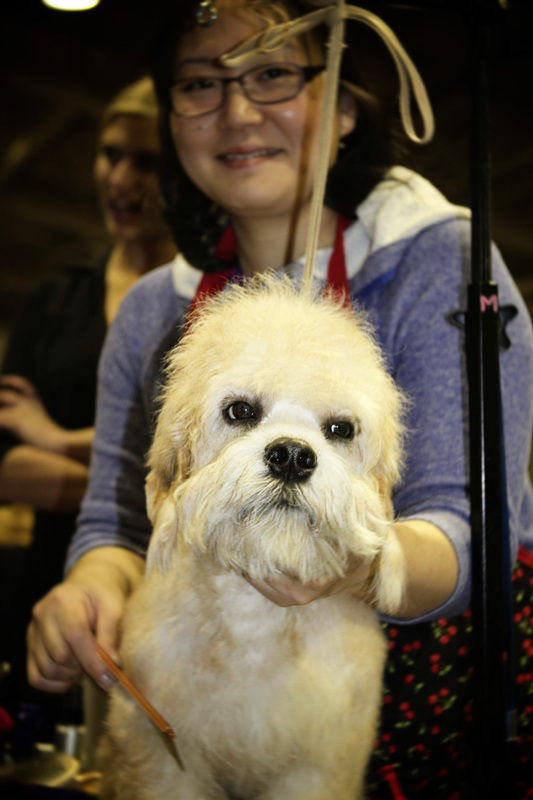 He won Best in Show on Friday, which happened to coincide with his 2nd birthday. Woot! Woot! What a wonderful present for both he and Cassidy. I got to see him in the show ring on Sunday competing for Best of the Best against the other two Best in Show winners from the weekend. Although he did not win that title I can imagine the judges had an incredibly difficult time picking a winner with him in the ring. The bond that the two of them have together is evident, lots of love there. 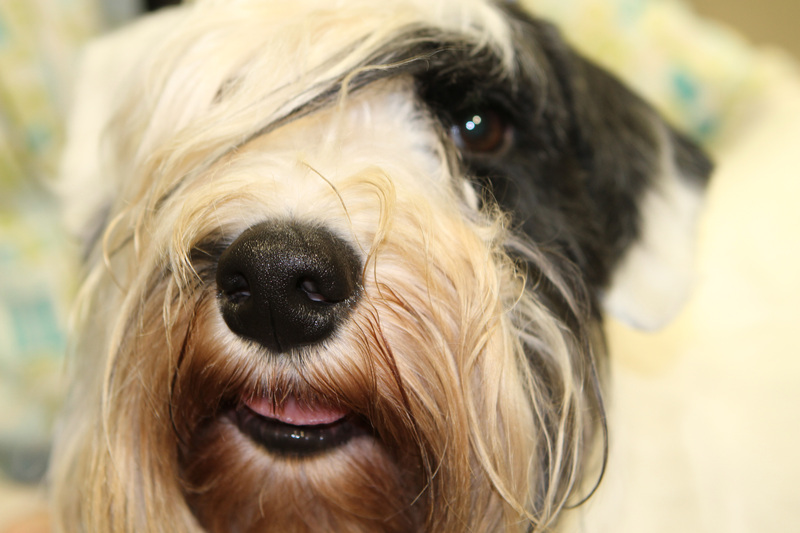 Number 7 – Meet Whiskey, this handsome fellow is a 3 year old Sealyham Terrier lovingly owned (and shown) by Lisa Jowell. 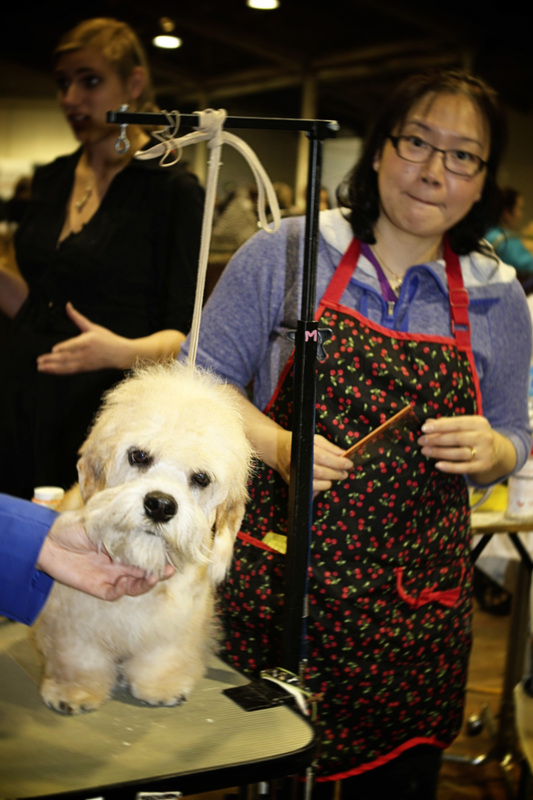 They came to the Alberta Kennel Club Winter Classic dog show at Spruce Meadows in Calgary all the way from Winnipeg, Manitoba. 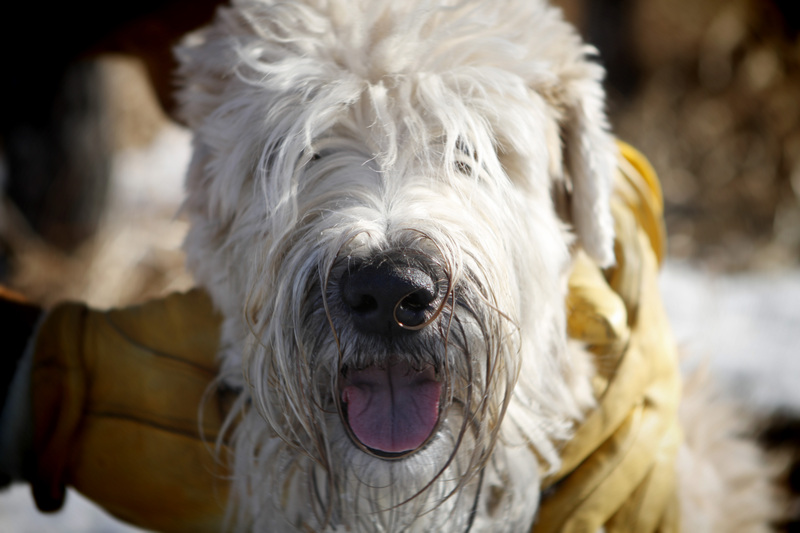 Lisa owns Avalonis Sealyham Terriers. 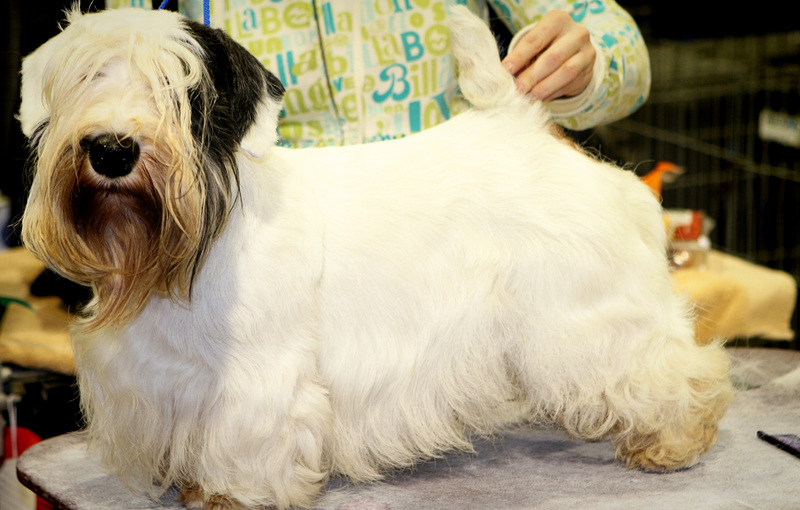 Whiskey is the son of Charmin, the most winning Sealyham Terrier ever! Sealyham’s are keen and alert dogs, quick, compact and tenacious; they are very powerful and determined. Whiskey will be a new dad in the near future! He was recently bred with Alice and they are expecting pups at the end of February. His registered name is Thunder Rd Fortunate Son. Whiskey getting ready for the ring. Number 6 – On a beautiful day today at the Black Diamond off leash area we met this handsome young boy, Toto, a 2 year old Shepherd cross and his wonderful owner Linda. We met at the end of our walk and just the beginning of theirs. I have to say he was such a well behaved boy given his age and the fact that he probably really wanted to get into that park and get sniffing and playing. I was impressed. Toto was happy to give me lots of kisses in exchange for a chest massage. He tried his best to engage some of my pack in play with a paw to the head but they were tired from their walk (and well, Bella is always crabby) so they just wouldn’t buy in. Toto was adopted through ARF at the age of three months. He came from a litter of 14 pups if you can believe it! I understand that many of them also have the wonderful disposition that Toto has (he must have had a good mom). He was given the name Toto by the rescue group; Linda was told by a friend that Toto means ‘small child’ in Swahili. She thought that was appropriate for him so it stuck. Toto and Linda. Isn’t he handsome! Toto waiting for a cookie. 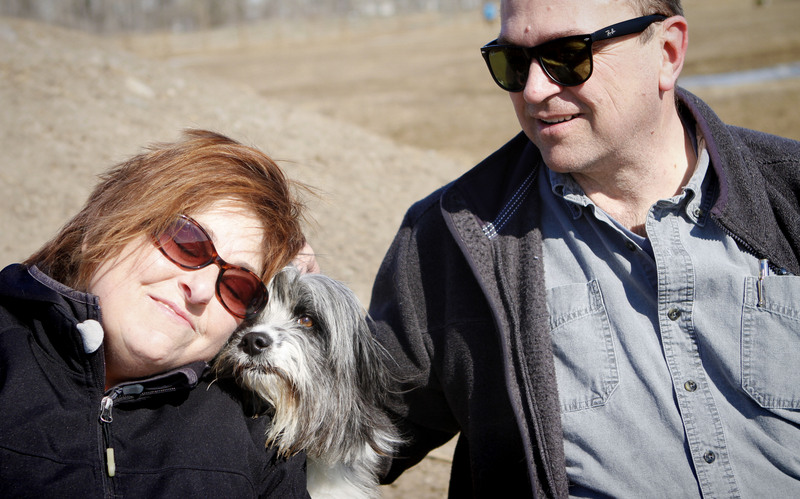 Number 5 – We had the pleasure of making the acquaintance of little Finn, a 3 year old Yorkie and Papillon mix and his lovely owner Tammy on our walk this past Tuesday. Finn was a little shy at first as he had a bad experience with two bigger dogs not that long ago and he isn’t sure whether he can trust other dogs which is such a shame. Once he had the chance to say hello to my pack and my friend’s dog Summit, he was comfortable and went about sniffing and saying hello the way dogs do. He originally hails from Saskatoon; Tammy met him in a store there (not a pet store) on a trip and after coming home and mulling it over she realized she had fallen in love with the little fellow. Tammy made the 7 hour trip back to get him shortly after that and they became best friends soon after. He is a very smart boy and loves to do tricks. His best one is a bow but he wasn’t interested in showing off in front of the other dogs. Finn making lovey dovey eyes at his mom. Yes, this is MY mom! 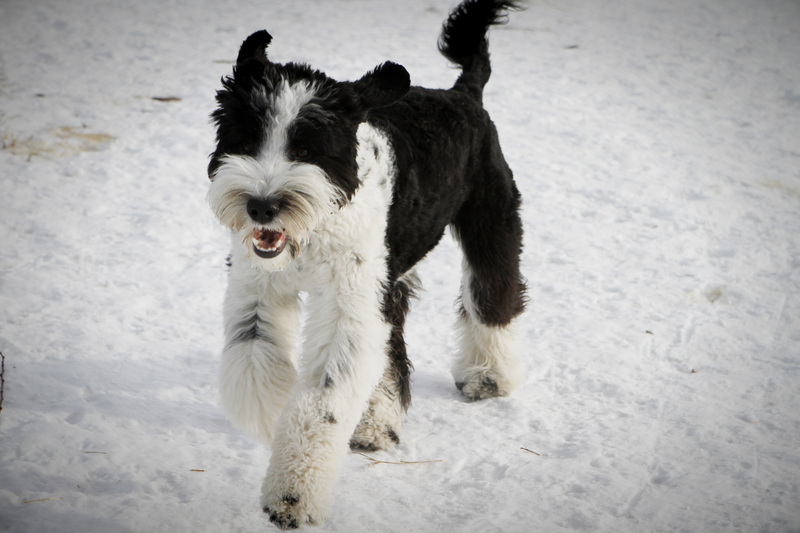 Number 4 – Get ready to meet LEX a bouncy, exuberant 8 month old Portuguese Water Dog and the person he loves that was with him, Greg. I met them at the end of our walk at the Southland Park and at the beginning of theirs so he was super excited running from dog to dog saying hello and asking them to play. There were just so many dogs to meet and greet he could hardly contain himself and he was adorable. Lex was named by Greg’s wife after Superman’s best known enemy Lex Luthor. I have to say there is nothing villainous that I saw in the few minutes we met just lots of happy bouncy energy but you never know what havoc he creates at home :). I really love the name, it suits him, he is a handsome boy. Trying to get a good shot of Lex at the start of his walk was a little challenging but he sat still for a millisecond, sort of, then was off quick as a flash to play, play, play. 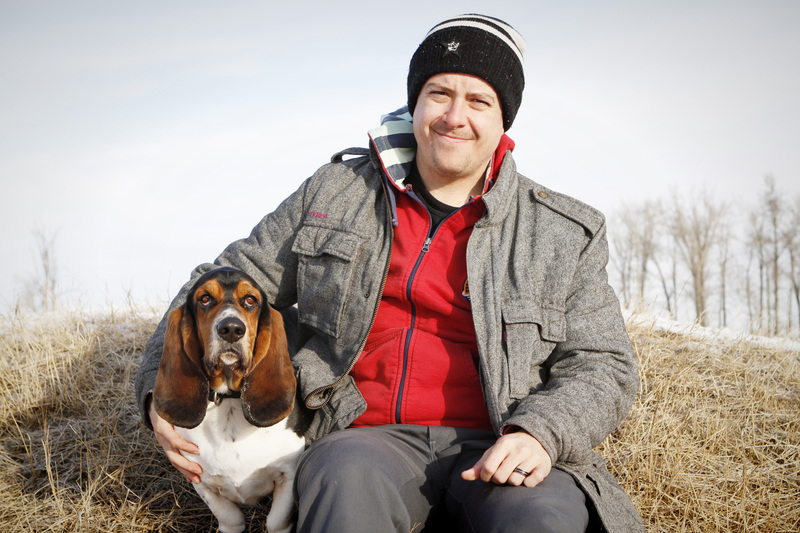 Number 3 – I am pleased to introduce you to NABOO a personable 4 year old Basset Hound and his owner Jeff. 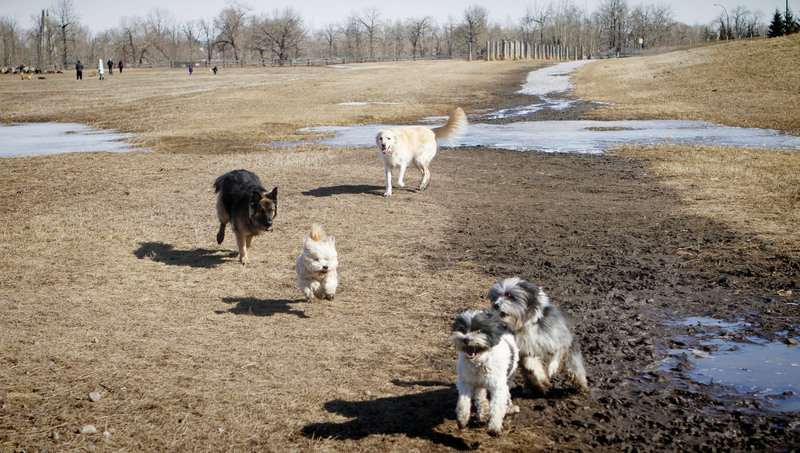 We met walking at Southland Dog Park in Calgary. I saw Jeff, Naboo and his ‘Grandma’ Tracey playing a game of hide and seek and chase at the park. I just had to go over and say hello and ask if I could take a photo they were having such a good time. He is such a friendly fellow; Jeff said he should really be wearing a greeter vest as he stops to say hello to every dog and person walking down the paths. He gets quite sad when people don’t take the time to say hello and give him a pat. I love his name and found out he is named after Naboo the Enigma, a quirky shamen character on the British TV show ‘The Mighty Boosh’. He loves his veggies, especially peas and green peppers and he seems to think he likes raspberries but can’t make up his mind. He really loves his spa getaways at Grandma’s house, where is is pampered with lots of walks and a special spot to curl up in. He is just such an amiable fellow, tottering along, occasionally tripping over his ears. It was a real joy meeting him and his people, he is most definitely loved very much and I have to admit he stole a piece of my heart too! 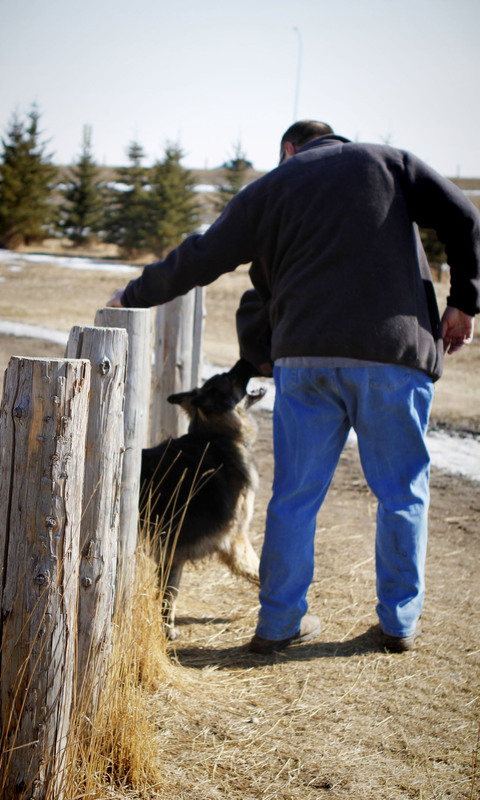 Number 2 – Meet KYAH an adorable 9 1/2 week old German Shepherd pup with her guy Steve, a firefighter in Calgary. She is such a sweetie and she really just wanted to play with my dogs (and their leashes) instead of pose for a photo. 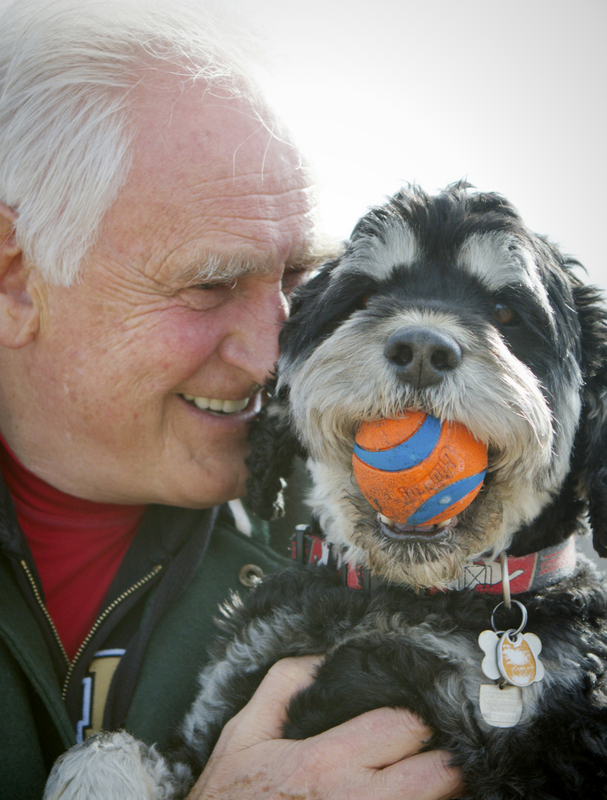 Number 1 – Meet JACK, a 3 year old Golden Retriever and the people he loves Pascal and Isabelle. We met on a walk this afternoon in the Sheep River area. 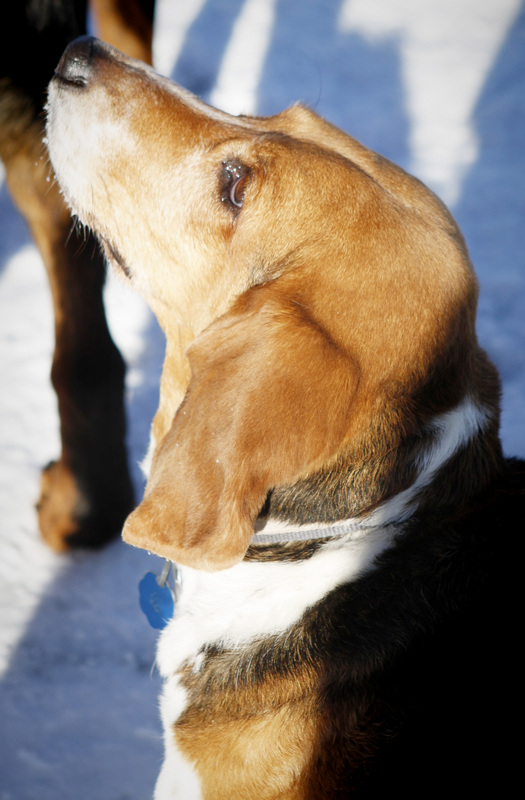 He is a wonderful dog, sweet and friendly, happy to be out for a run and play with his people. Pascal and Isabelle have owned Jack since he was a puppy. When they went to pick a puppy he was there were two others and they said that Jack picked them. With two daughters at home, Pascal is glad to have Jack as a member of the family so he isn’t quite so outnumbered. I could’t have asked for a nicer family to approach for my first photo of the project. What a nice looking golden! He’s a beautiful boy. And, love little Kyah with his almost not there eyes! This is so awesome Sheila! I so admire your courage and initiative to do this project! Looking forward to reading more, and seeing more pics! Thank you Christina! I am getting the hang of it and I am sure it will evolve as my project progresses. I am having fun! You’re off to a great start on your project! What a wonderful idea Sheila. Fabulous photos, Sheila. You’re off to a fine start! You are welcome 🙂 thank you for stopping by and looking around, I really appreciate it! Kyah and Steve; great photo. Love the pup and Steve!! Thanks very much! Got it…I’m following your blog now. Looking forward to your dog tales. 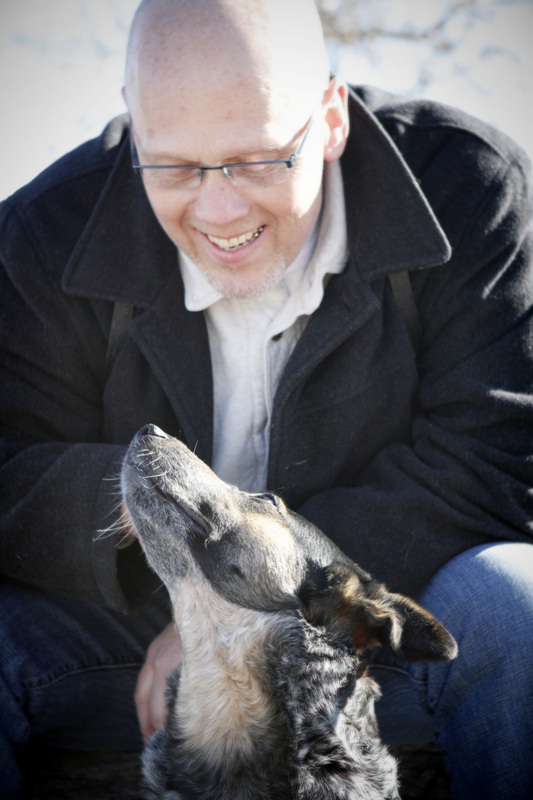 I ran a dog walking and pet sitting business for four years and I really should have written a blog then….boy of boy, the stories and adventures. Enjoying your posts and photos! Great idea to go to the dog show! Thanks so much Barb! i hope all my plans and ideas pan out for this project 🙂 I’m having fun. Thanks Kathie! I appreciate that so much 🙂 I went to listen to Steve Simon speak the other night on having photography projects and being passionate and it really got me more excited about doing this; it was a great lecture! Ok, who is Steve Simon? He’s a Canadian born, New York City based photographer. He was promoting his book The Passionate Photographer through a class at The Camera Store. Really nice guy, interesting lecture, very relevant to what I’m doing (although mine is a very small, but important to me project). We talked about my project and he told me I can email him any time with questions or to tell him my progress. I believe he has had 5 books published, 4 on his different projects. Interesting. Did you happen to ask him whether or not he ‘self-published’ and if there was a measure of commercial success attached to the publications as well as personal satisfaction? I don’t believe he self published. He has had both commercial success (8 pages in Life Magazine as well as a book published on a 9/11 project) and a lot of personal satisfaction. His latest book (the one I purchased) talks in great detail about personal photography projects. It was a fantastic presentation, really spoke to me. wow, that’s a LONG post!! I was trying to leave a note to let you know that Patty is the daughter of a couple I walk with every Sunday morning. I had no idea you were local — when I was blog hopping for Kat’s postcard hop I thought you were in the USA.